The need to consistently find and connect with potential new customers. It doesn't matter what you're selling or how good it is. If people don't know about your offering, they won't buy it. This is why it's so important to connect with your target market and convert them into users who are aware of your offering and interested in purchasing it. This is a process known as lead generation. 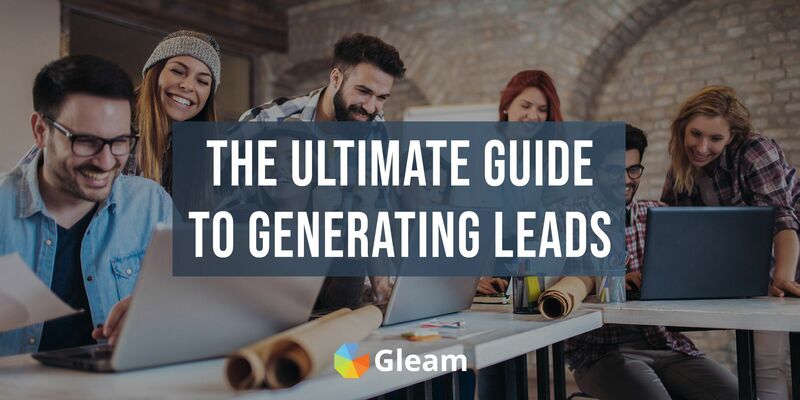 In this post we're going to take you through all the best ways you can generate leads and set yourself up to drive sales, but first we're going to take a look at exactly what a lead is. A lead is essentially any user who has displayed interest in your product or service, and lead generation is simply the process of initiating customer interest in your offering and opening communication with them. Leads can be captured by getting users to perform an action which signifies their interest in your offering. This typically involves you collecting information from a lead such as their name and email address. Generating and capturing leads allows you to open communication with potential customers, kick-start customer journeys and put yourself in a perfect position to drive acquisition from users who have already expressed clear interest in your offering. Outbound leads are users with an interest in your offering which you find by reaching out to them yourself. Outbound leads most likely won't know you before you reach out to them, and the marketing material you use to connect with them will be the first interaction they have with your brand. There's a lot of debate surrounding what qualifies as outbound marketing, but following the idea that it's any marketing activity where you are reaching out and initiating contact you can consider outbound lead generation to include tactics such as paid ads, cold emails, and certain social media campaigns designed to initiate content. 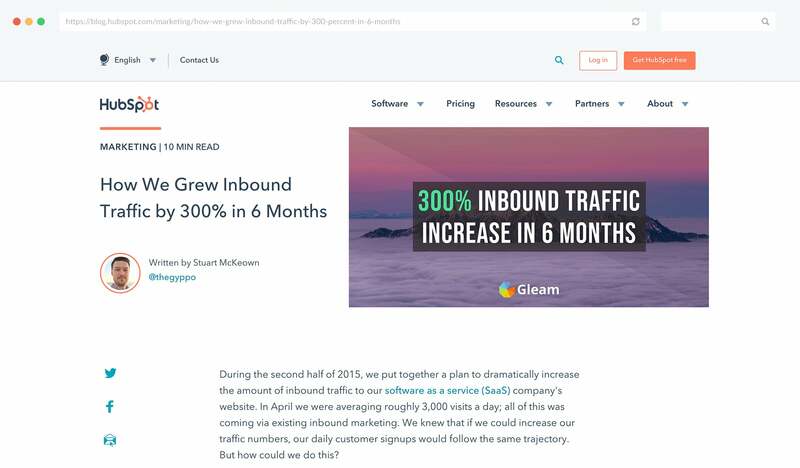 Inbound leads are the users who come to you. These users will discover you and the content you put out through search engines, social media and other online platforms. You can drive inbound leads by engaging in inbound marketing activities such as creating engaging and valuable content, optimising your website for lead generation, engaging in SEO activities, and doing whatever else you can to help users find you and form an interest in your offering. Thanks in large part to the interconnectedness and complexity of our online landscape the line between outbound and inbound marketing is often blurred. Optimising your content for Google searches is clearly inbound marketing, but how about targeted Google Ads? Do you consider social media inbound or outbound marketing? A compelling case can be made either way. Unfortunately there isn't any definitive answer to these questions, but the good news is that it doesn't really matter. If you want to put together a comprehensive and effective lead generation strategy then you will need to strike a balance between the two approach and employ a range of inbound and outbound marketing strategies. Keep reading to find out all our best tips and strategies for generating leads which will help you build awareness, drive sales, and grow your business. The best approach you can take to generating leads is implementing a variety of strategies to drive traffic to your landing page, and then using your onsite content, as well as some special offers to encourage users to sign up with their email address. If your website is properly optimised to convert visitors into leads then you will be able to devote a lot of your efforts to finding relevant users and sending them to your website with the confidence that you can convert them to leads once they arrive. When users land on your website you want them to be instantly engaged, compelled by your offering, and ready to sign up and become a lead. 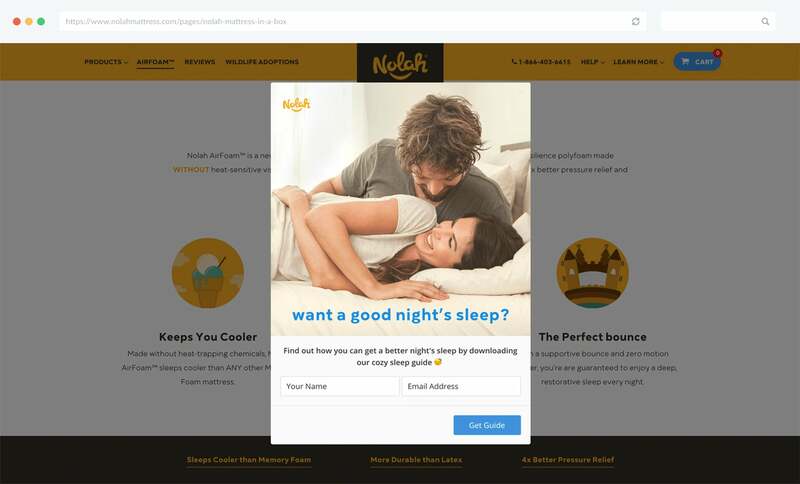 The best way to do this is with a well-executed and exciting landing page that grabs users' attention, highlights the value of your offering, builds product-interest and ultimately encourages them to sign up. 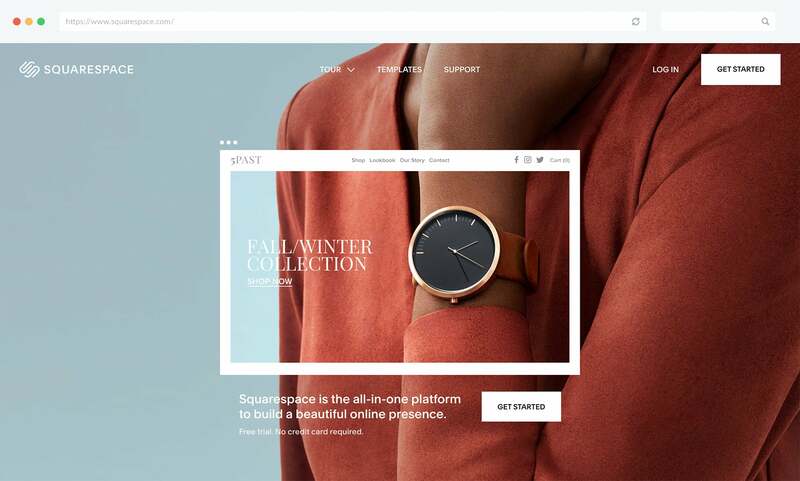 A great example of a landing page comes from Squarespace who put together a visually engaging landing page designed to drive free sign-ups. Plus, when you scroll down you can see all their features with clear CTAs every step of the way. In order to build an effective landing page it's important that your page explains or, better yet, demonstrates what your offering is, what problem it solves, what its benefits are, and exactly why visitors should sign up. This can be anything from access to the latest news and special offerings, exclusive content, a discount, a free trial, entry into a contest, or any other valuable incentive you can offer. An eye-catching and exciting headline, supporting headline and value statement. A unique selling proposition. Something that only you can offer. Highlight the benefits of your offering. 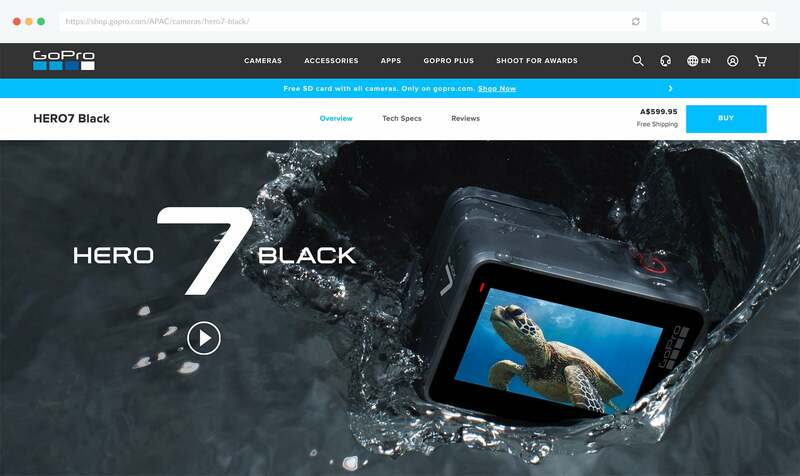 Appealing images or videos with a focus on product usage. A clear and concise call to action. If you're able to successfully execute your landing page you'll be able to boost product interest and generate leads with ease. 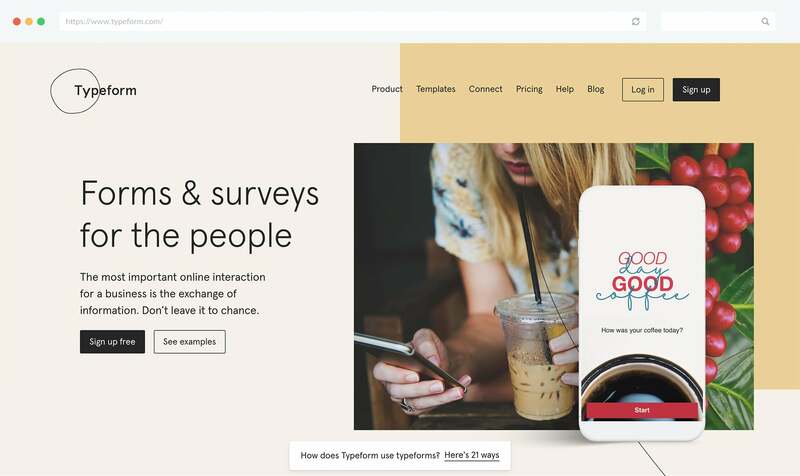 Building a landing page designed to generate interest in your product and drive signups is a particularly effective strategy for pre-launch businesses looking to build hype and cultivate an audience before they go live. This is a brilliant way to ensure that when you do launch, you're launching to an excited audience that can't wait to get their hands on your product. So if you haven't released your product yet, get out there and build hype on as many platforms as you can, and try funneling traffic back to an awesome landing page which you can use to capture your leads. 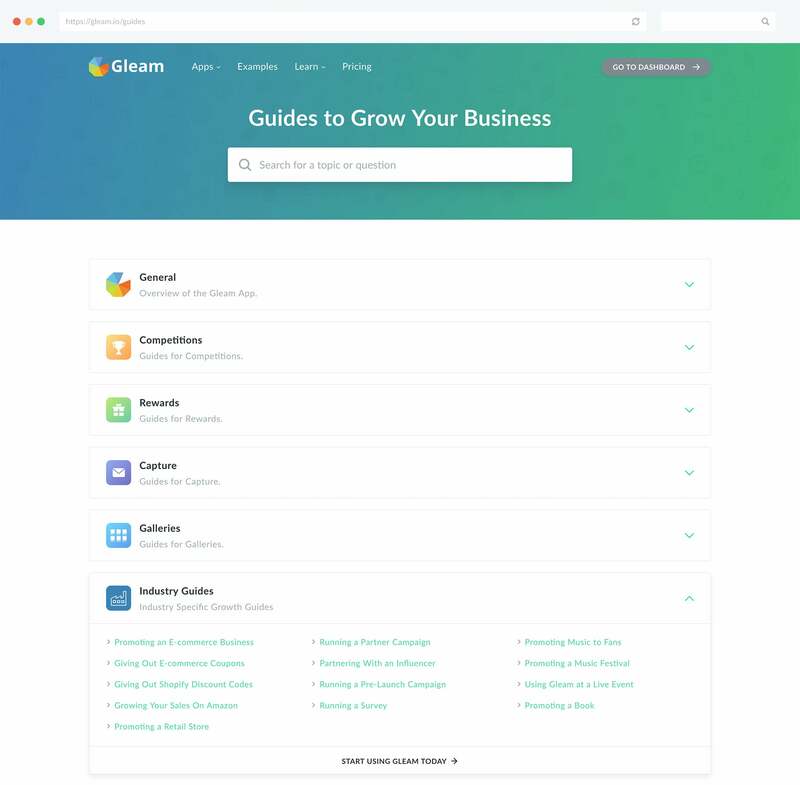 Take a look at our helpful guide where we break down all the best ways you can grow your business before you launch with Gleam. Depending on exactly what it is you're offering, a single landing page might not cut it. If you offer several different products, or multiple product categories then it's in your best interest to create a unique landing page for each of these categories. If you're an E-commerce retailer this can be a great way to drive sales leads. Using contextual landing pages allows you to create highly targeted pitches that are far more likely to resonate with an audience seeking out a particular type of product than a coverall landing page that tries to squeeze the value and benefits of all of your products into a single page. 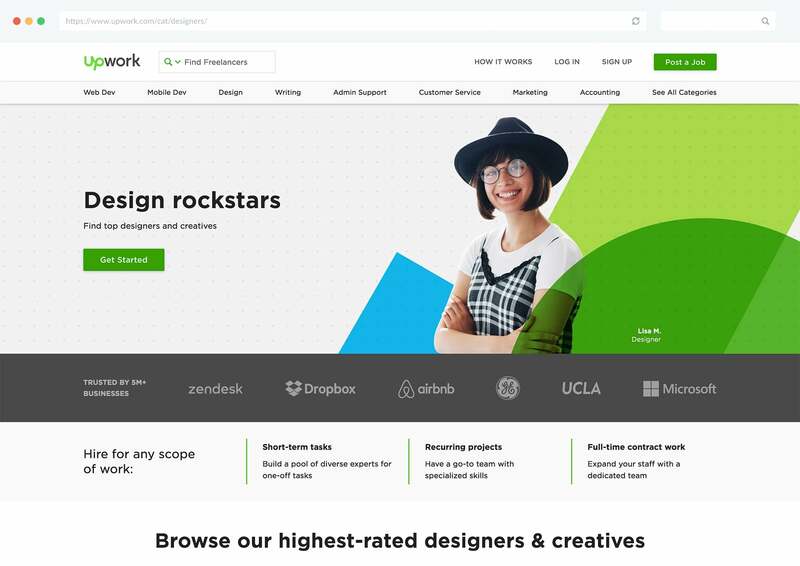 Upwork excels in this regard and have put together a number of landing pages covering every field they operate in. As well as creating unique landing pages for all of your products, it can also be a good move to build targetted landing pages for different SEO keywords. For example, if you're an SaaS with a product that can be used for multiple purposes or multiple industries you should try making a dedicated landing page for each of them. This will allow you to not only reach a wider audience looking for specific solutions, but also give you the opportunity to put together tailored propositions for each of your consumer segments which can skyrocket your conversion rate. If you offer a location-based service then you should take a similar approach and create landing pages for every location you service. This level of personalisation will help you connect with relevant audience and put forth personalised pitches that are great for generating leads. 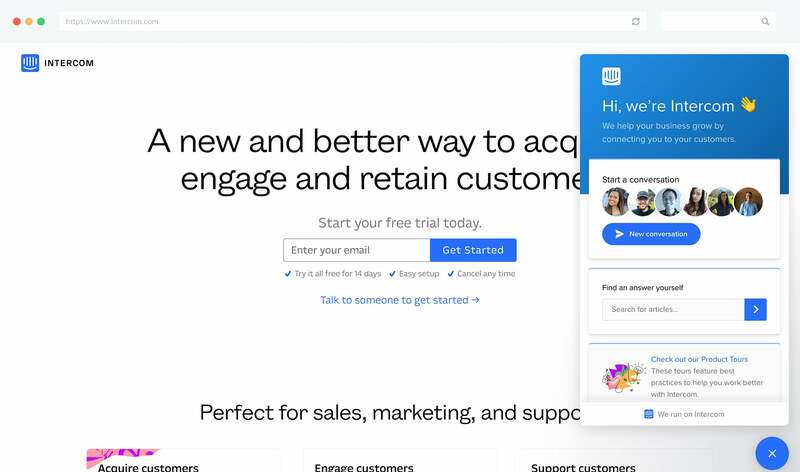 A great way to kick your lead-generation into high gear is offering free trials or discounts on your products to users who sign up. This is a truly outstanding way to not only generate leads, but also give yourself an incredible opportunity to convert these leads into customers by getting them to trial your offering or even make an instant purchase. 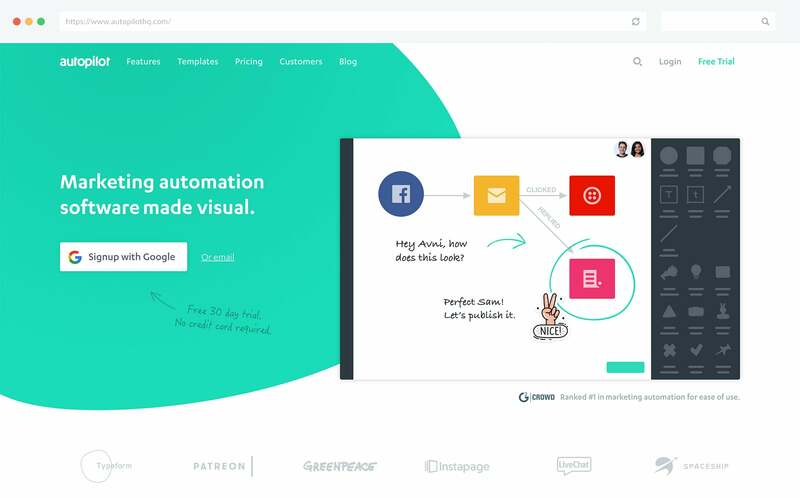 Autopilot does a great job of using free trials to generate leads, but that isn't all they rely on as their landing page is also filled with customer testimonials, product videos and more. 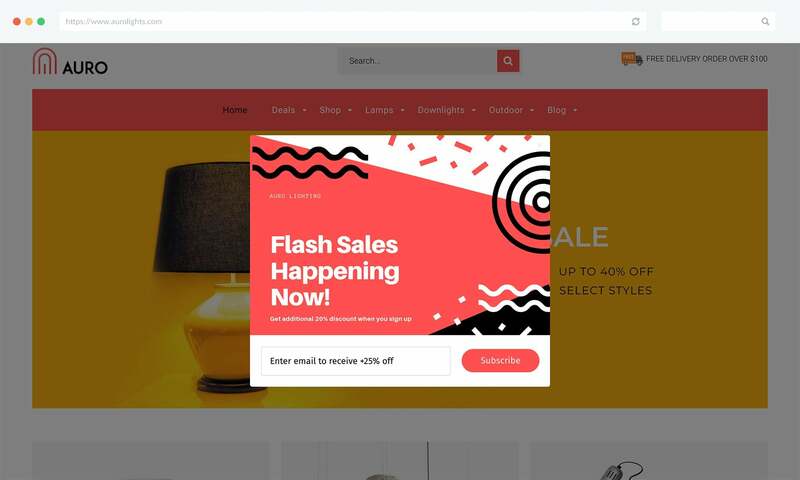 You can use free trials and discounts to drive lead generation by putting these offers front and centre on your landing page or by housing them in a stylish popup which you can easily make with products like Gleam's Capture app. When it comes to generating leads it's clearly vital to show off what your product is, what value it provides and what problems it solves. 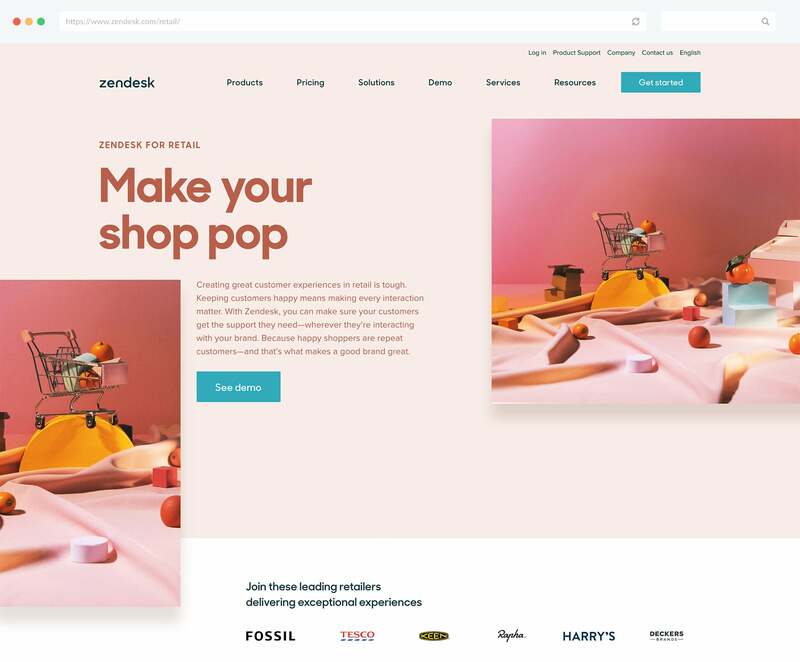 Take a look at how you can use Capture to build your own discount popups and use them to generate leads and drive sales. There are a few other important features you should incorporate into your landing page which will help you endear yourself towards users, build product trust and familiarity, and ultimately drive users towards sign up. One of the best things you can do to build interest and connect with your audience is help them overcome a problem they face, teach them learn a new skill, or show them how your product can do that for them. A great way to provide your target marketing with valuable knowledge, insights and skills is to host a webinar. The best course of action is to put together a webinar in your area of expertise. Focus on a topic that's relevant to your niche, incorporates your product, and is valuable for people to learn. You need people to want to join your webinar afterall. Just remember to focus on providing real value rather than just plugging your product. This will make the whole thing seem incensere and lacking in value. 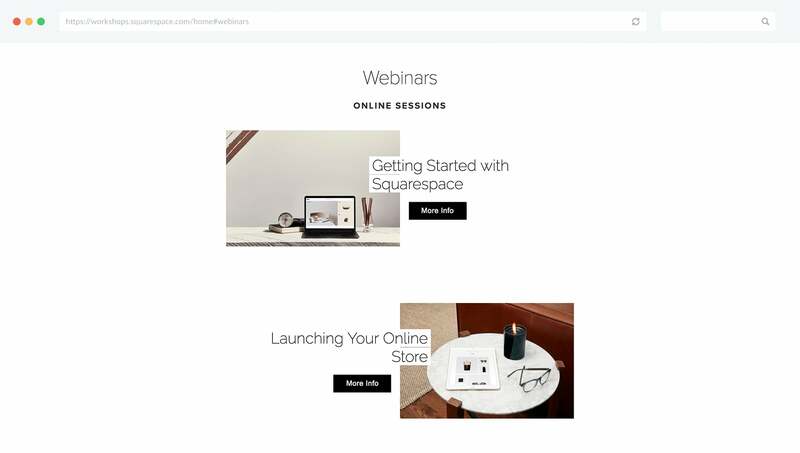 If you can successfully execute a webinar you will be able to connect with your market, position yourself as a trusted authority in your niche, explain and promote your product, generate leads, and kickstart customer relationships. When you run a webinar it's important that you're maximising awareness and participation by getting out and promoting it. 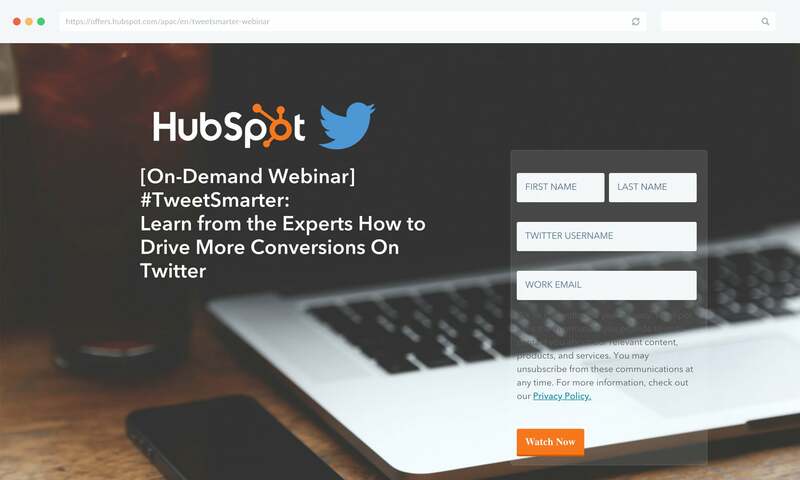 You can do this by announcing your webinar to website visitors with on-site notifications, spreading the word on social media, or incentivising signups with Rewards campaigns that offer discounts to users who sign up to your webinar. You don't even have to put together a live webinar event for this to be an effective strategy. You can put together a pre-recorded automated webinar and provide access to anyone who signs up for it. This approach offers a more flexible apporach that will allow you to reach more people and get a lot more longterm value from your webinar. The main downside of automated webinars are that they don't allow for two-way interaction which is great for answering questions and providing participants with a more personalised and valuable experience. You can partially overcome this by adding a live chat componant to your webinars but this will diminish the time-saving benefits of automated webinars. Ultimately both live and automated webinars have their own pros and cons, it just comes down to what works best for you. Providing some sort of social proof of your products effectiveness and functionality is a truly outstanding way to promote your offering in a trustworthy and reliable way. Praise from customers is always going to be more authentic and reliable than praise from yourself. This makes showcasing referrals, testimonials and customer success stories a hugely valuable asset when it comes to generating leads. 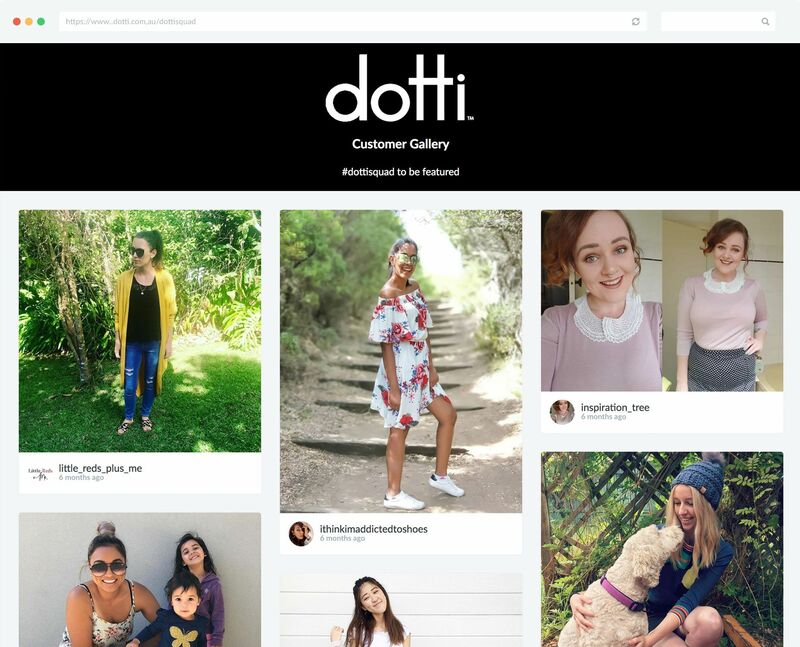 You can include customer testimonials on your landing page, provide case studies that highlight customer success stories, or if you're in an appropriate industry, put together a stylish gallery of satisfied customers. If you want people to really take an interest in your product and consider purchase or adoption then it helps if you can show them your product in action. How you go about doing this largely depends on what your business is, but there's always a way. If you're an SaaS then you should create high-quality live demos that show off the full capabilities of your product. This is something we do on all of our product pages. We even annotate the demos to give users a clear understanding of exactly how our products function. If you're selling a physical product you should put together a product video that explains what it is and why people need it. If you're selling a more straightforward E-commerce product then it may be enough to display some high-quality photos of your product. This can also present you with a perfect opportunity to display product photos from your community. Allowing users to live chat with your business from inside your website is a fantastic way to answer any questions and queries prospective leads may have and provide them with all the information they need to develop a serious interest in your offering and become a lead. Often an unanswered question is all that stands between a undecided user and a sign up, and live chat is a great way to help you overcome this potential barrier. Having an accessible and comprehensive FAQ can help you tackle the same challenge, but Live Chat has the added advantage of allowing you to directly engage with potential leads and cater to their specific situation and needs. As powerful as landing pages can be, they aren't the only way you can generate leads inside your website. You can also use opt-in forms that display targeted messages and prompt visitors to sign up at the perfect time. With Gleam's Capture app you can create a wide array of personalised opt-in forms that you can use to generate leads from anywhere on your website. 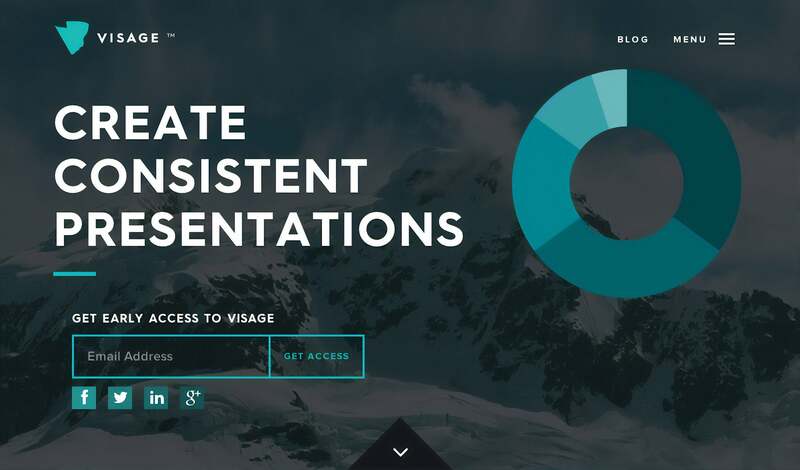 Plus, it's a whole lot easier than building a landing page from scratch. 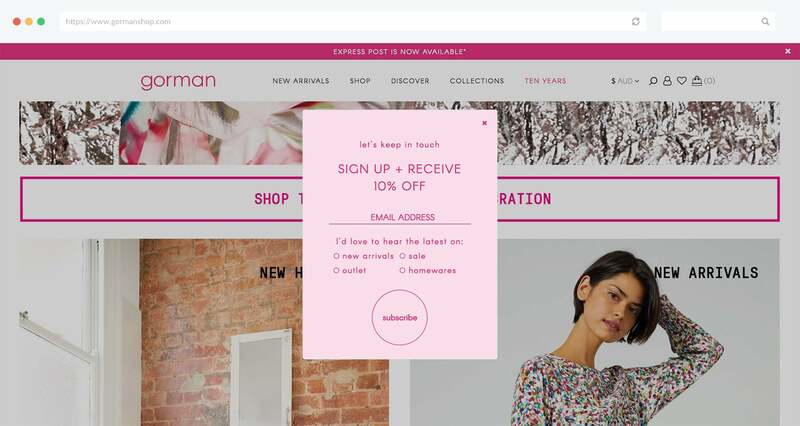 Opt-in forms can be a particularly effective lead generation strategy for e-commerce retailers who are likely to forgo a sign up landing page in favour of driving traffic to their products and store. 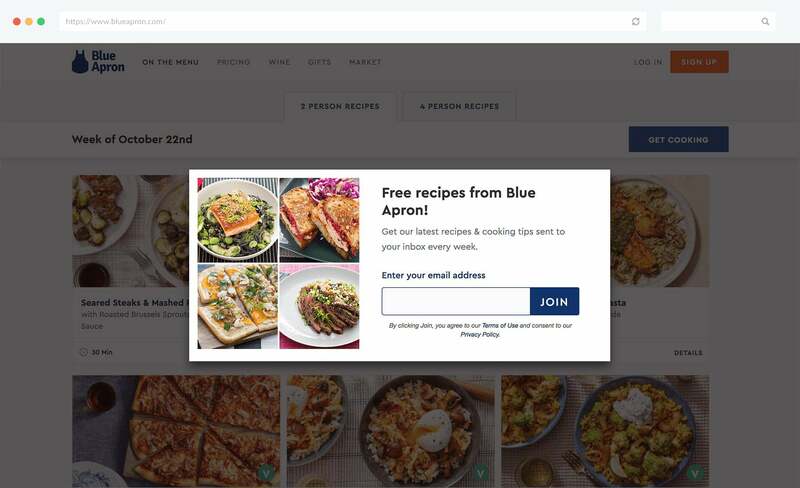 If you want to start capturing leads as soon as they visit your website then you should try displaying a popup opt-in form on your homepage which will grab users' attention and encourage them to sign up. If users have already developed an interest in your brand then there's a good chance they'll sign up right away, but if you want to maximise lead generation then you may want to consider offering up some kind of incentive. 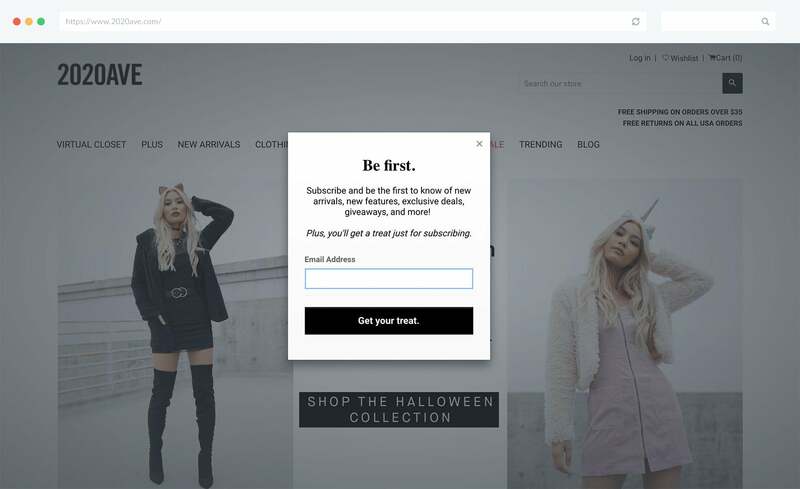 Asking users to sign up to your mailing list is a particularly effective strategy when you're offering them some sort of incentive for doing so. 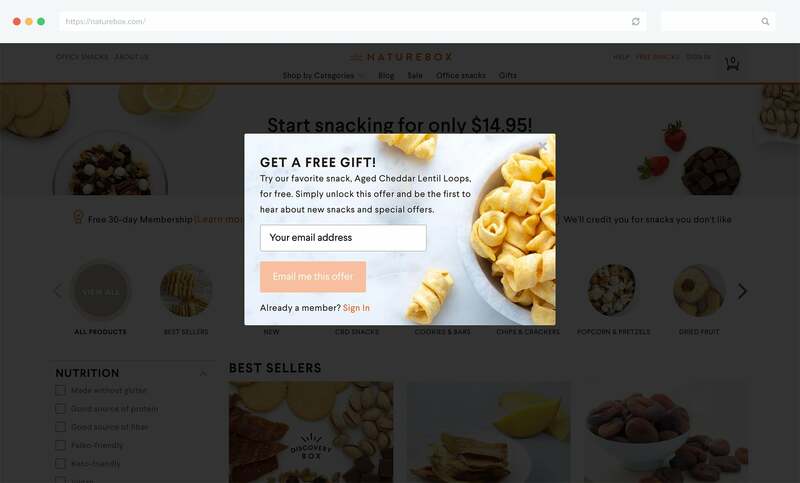 Incentivising sign-ups won't only help you generate more leads and open up direct communication with prospective customers, it will also enable you to drive more sales by providing users with rewards such as discounts, free trials, and samples which make purchase and product adoption much more likely. This is a fantastic way for businesses to kick-start customer relationships and make it a lot easier to drive sales well into the future. 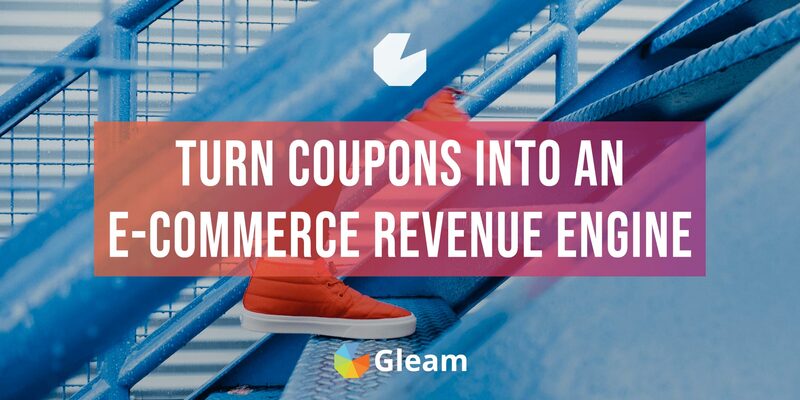 With Gleam's Capture app you can easily build stylish popup coupons which you can use to capture leads and instantly distribute discount codes. Giving users a discount code from within your store is also an awesome way to drive some immediate sales. Discounts aren't the only way you can incentivise sign-ups. You can also try giving leads free gifts which will give them a taste of your offering. This can be anything from a free trial to a sample product. Free trials and samples is a great way to get leads to trial your product and see its value for themselves. This will make it a lot easier to convert your leads to customers when you do reach out to them. The gift you use to incentivise sign-ups can even be something as simple as some insights and advice relevant to your product, or some exclusive content. 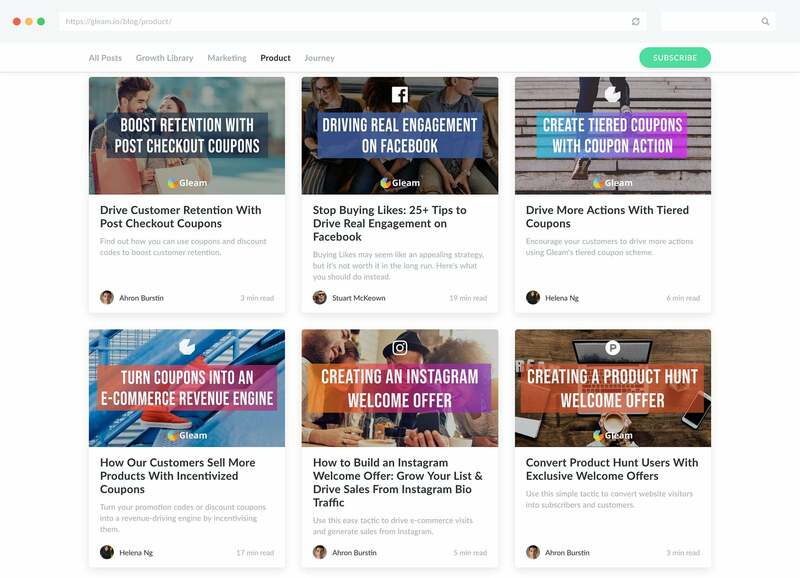 This will give interested users a reason to sign up and allow you to reach out to them with some additional content that should guide them further along the path towards purchase. We've already gone over using discounts as an incentive to generate leads, but it's worth mentioning that this already powerful tactic can be made even more effective by offering these discounts as a part of a limited time offer or sales event. 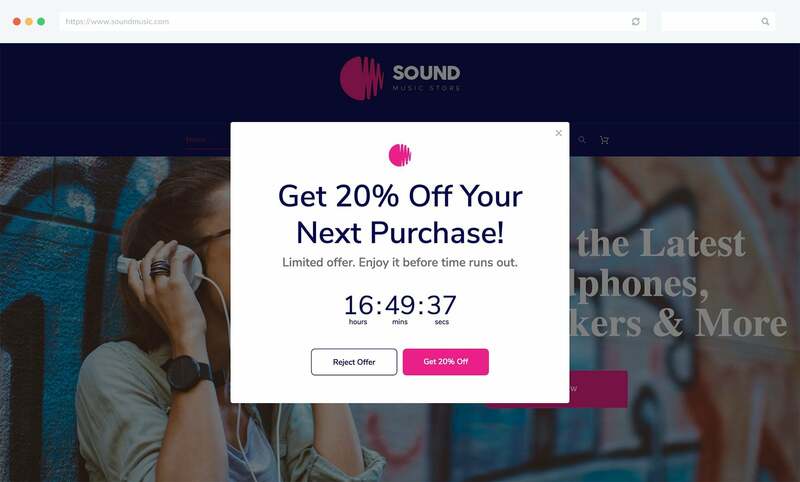 The added urgency of these offers will make users far more likely to instantly sign up and claim their discount than they would if it was an anytime offer. This can do wonders for your conversion rate. If you really want to drive home the scarcity of your offer and maximise sign-ups you can use Gleam's Countdown Captures to give users a timer showing them exactly how long they have to signup and claim their reward. Another awesome way to generate leads from inside your online store is to create opt-in forms specific to certain products. 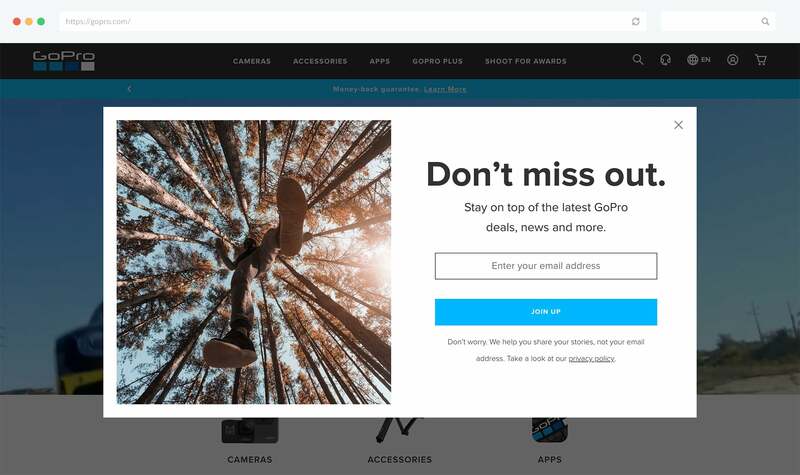 You can enact this tactic by triggering a popup on your product's landing page which asks users to sign up, possibly in exchange for further information, access to demos, or even a product discount. 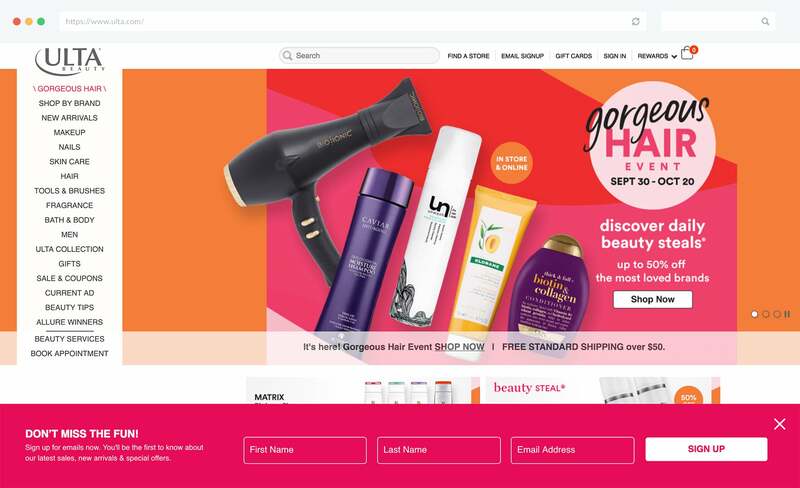 Another option which is perfectly suited for E-commerce retailers is offering tailored discount to visitors who check out a particular product or range of products. This is a great way to reach out to users who have displayed a clear interest in your offering, convert them into leads and guide your new leads one step closer to a purchase. 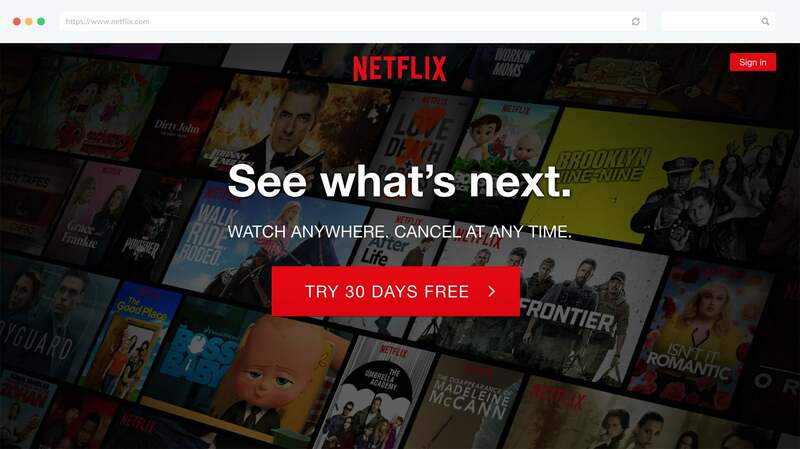 As effective as bold, screen-filling popup opt-in forms can be, sometimes you might want to prompt users to sign up in a more subtle and unobtrusive way. Taking this approach will allow your visitors to freely explore your website, learn about your offering, and then sign up when they're ready. You can accomplish this with opt-in bars which you display across the top or bottom of your entire site. You can even use these bars to give out coupons and encourage more sign-ups. Another more subtle approach to generating leads inside your site is triggering notifications on the side of your page. This is a good option if you want to make users aware of a special offer without distracting too much from the rest of your site. 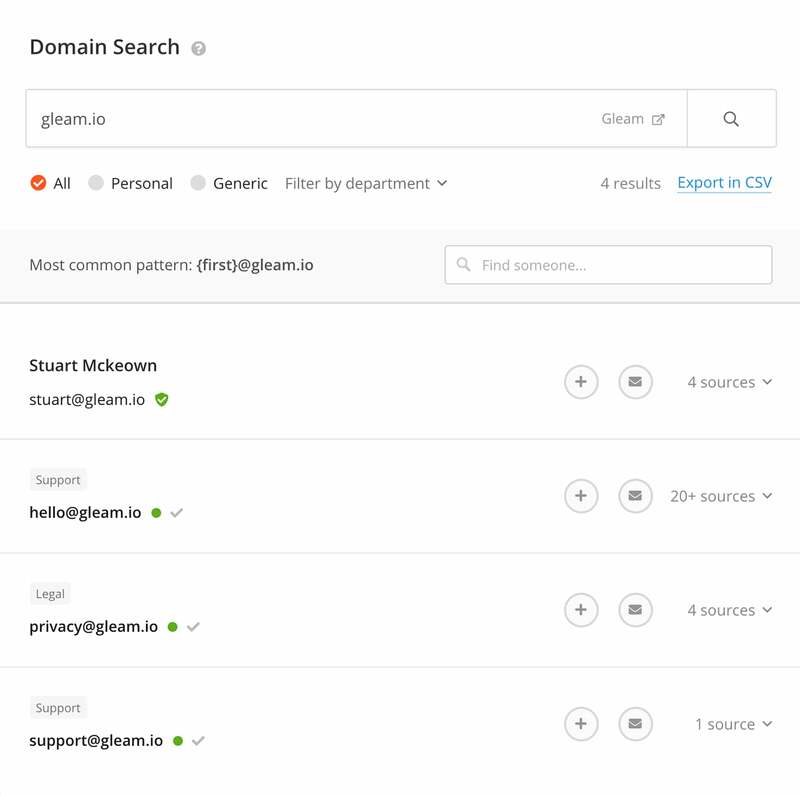 Sometimes you'll want to give users the chance to freely check out your site and discover everything you have to offer without asking them to sign up to your list straight away. This can allow users to familiarise themselves with your product and naturally build up more interest. While this can be an effective approach to take, you still want to make sure that users aren't leaving without signing up. This is where exit-intent popups come into play. 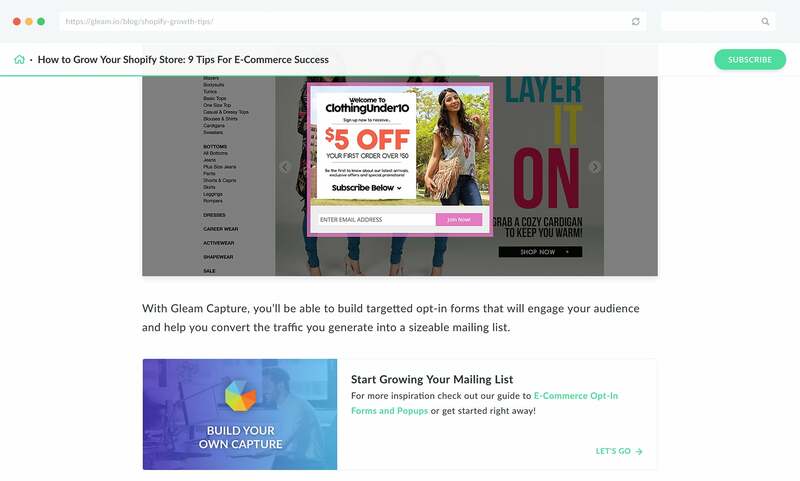 Exit-intent popups are opt-in forms which you trigger when users are about to leave your website, and with Gleam's Capture app you can set one up in a matter of minutes. 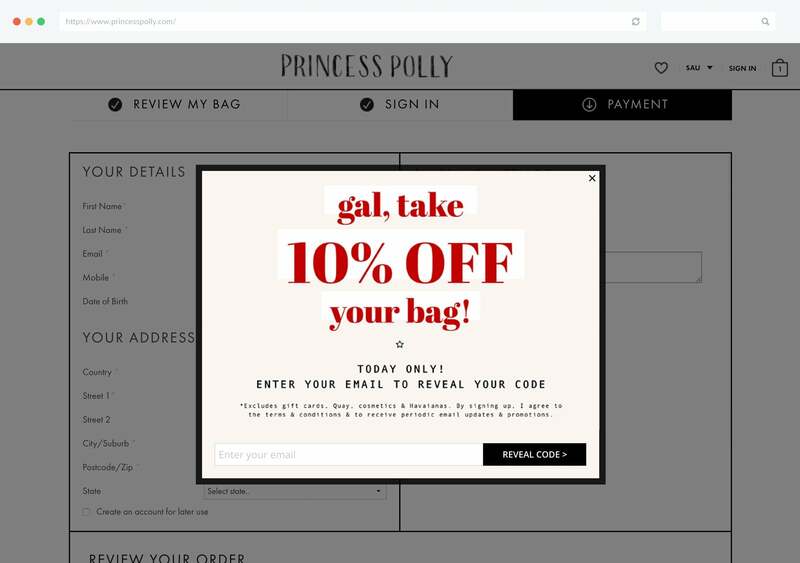 You can use exit-intent popups to offer users a valuable discount before they leave. Or offer them access to some exclusive content as a way to encourage sign-ups and keep in touch with exiting users. 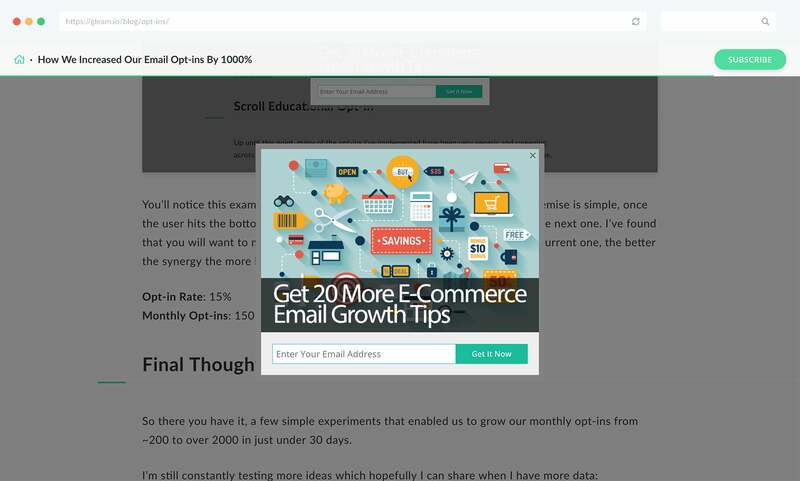 Exit-intent popups are an awesomely powerful lead generation tool that allows you to generate leads from users you would have otherwise lost. 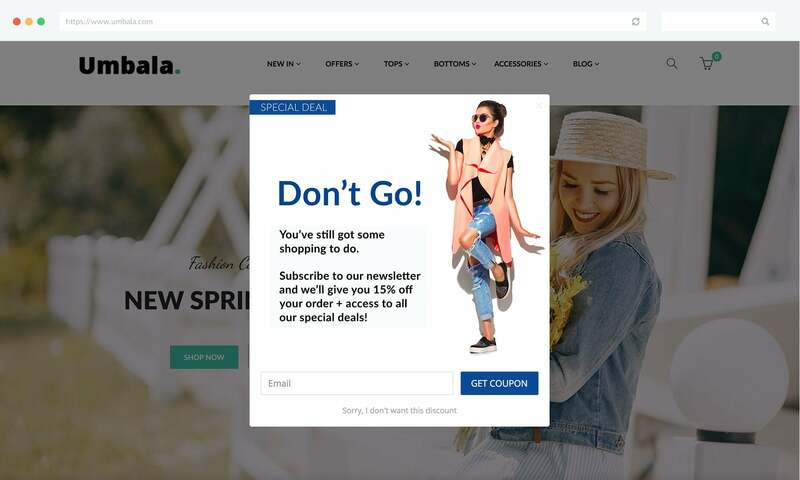 If you're an E-commerce business a particularly powerful implementation of exit-intent popups is the abandoned cart popup. These opt-in forms function the same as regular exit-intent popups, except they are triggered when a user is about to abandon a shopping cart with items in it. 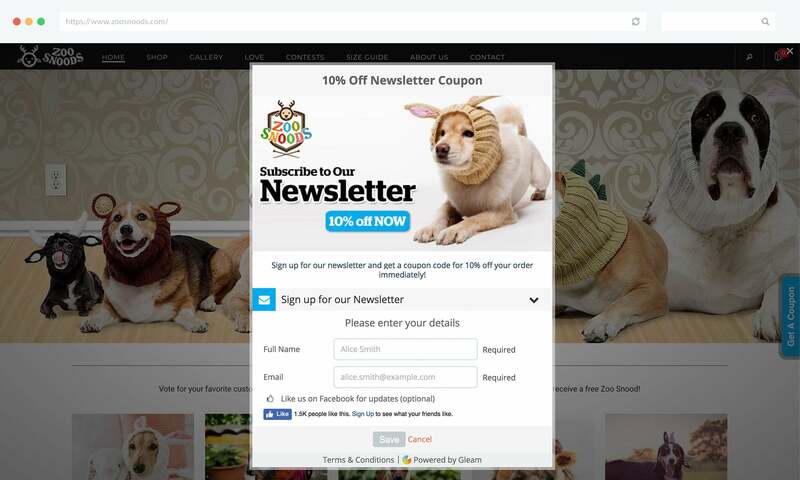 You can use these popups to offer valuable discounts to users who sign up. 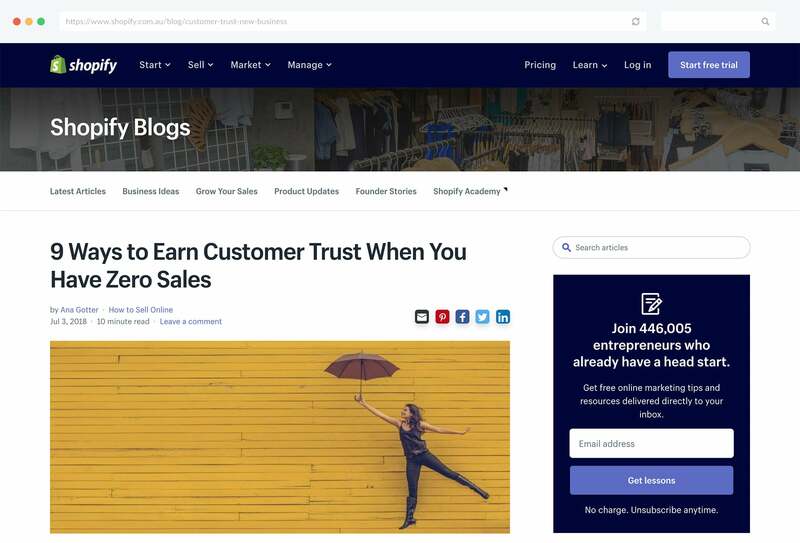 This will help you drive sales from interested users who may just need that little bit of extra incentive whilst simultaneously generating leads and putting yourself in an outstanding position to drive future sales. If you have a blog which generates traffic (we'll get to this soon) then you should be trying to keep your readers around and convert them into product users and customers. The best way to do this is by incorporating some opt-in forms into your posts. You can do this by having a subtle sign up form at the top or bottom of your posts, or by triggering a popup to users who scroll a certain way down your post. 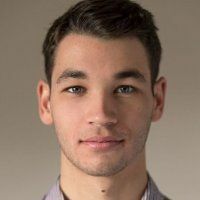 This is a great way to generate leads from inside your post by using your engaging content (possibly even some subscriber exclusives) to incentivise users to sign up. Check out our helpful documentation for step by step instructions on setting up your own opt-in forms or get started right away! We've taken a good look at generating leads from inside your website, and now we're going to take you through all the best ways you can kick-start lead generation by building interest and excitement and driving traffic to your landing page and website. The first strategy we're going to look at is producing high-quality content that will drive traffic to your site, engage visitors and ultimately generate leads. Writing high-quality blog posts is an incredibly effective way to attract relevant users, engage them, get them interested in what you do and ultimately convert them into leads. The key is to write content that is valuable enough to your target market that they will search for it and click on it, and relevant enough to your business that you can use it to generate leads. You can use your content to highlight the value of your product and use your blog to funnel traffic towards your landing page. Just make sure you're still focusing your posts on providing meaningful value and only talking about your offering when it's relevant to the topic at hand. People will tune out pretty quickly if you're blog posts are nothing more than ads. 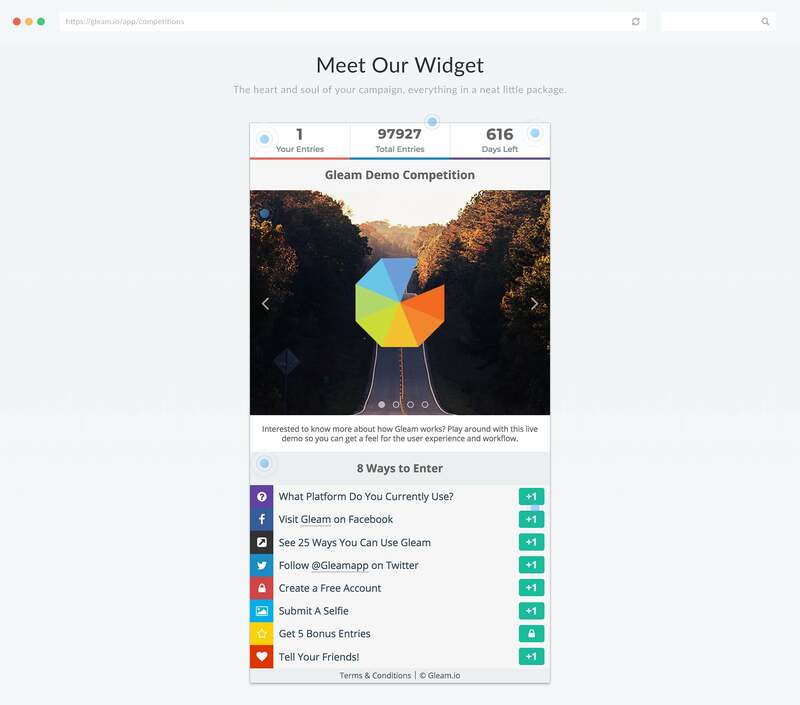 Encourage users to sign up to your list from inside the blog. 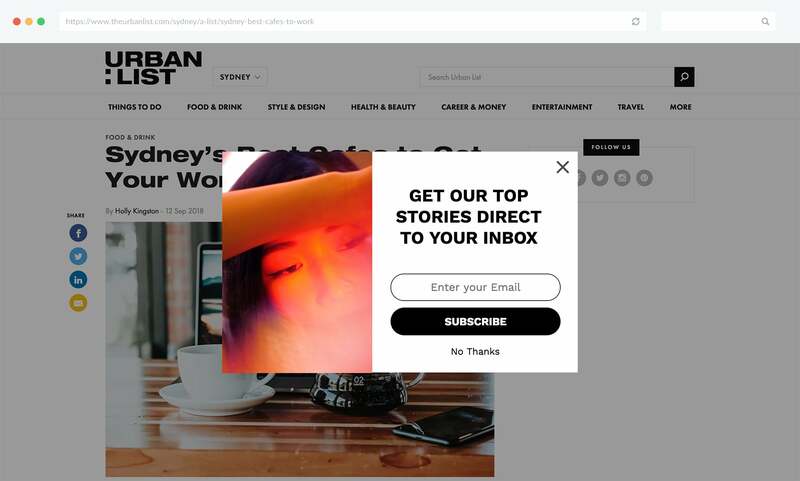 You can present readers with opt-in forms that ask them to sign up to stay in the loop and get all your latest posts, or you can even offer a content upgrade and use exclusive content to incentivise leads. You just need to make sure your content is valuable enough for sign-ups to be worthwhile. Most people who search for and click through to your post will be looking to find an answer or solve a problem. If you can provide them with exactly what they're after they'll be keen to check out more of your content, and be a lot more receptive to product pitches and sign-up prompts. Evergreen content is content that is always relevant to your target market. It focuses on topics that will always be fresh, or can be easily updated to stay fresh. If you can put together some awesome evergreen pieces that will always be relevant and searched for by your target market then you can potentially net yourself a massive ROI, as each post has the ability to generate leads indefinitely. We're not saying you should devote your blog to prattling on about how great your product is, because you shouldn't. What you should do is write about topics that are relevant to your niche and present you with natural opportunities to demonstrate the value of your product, and showcase your offering in relation to whatever it is you're discussing. 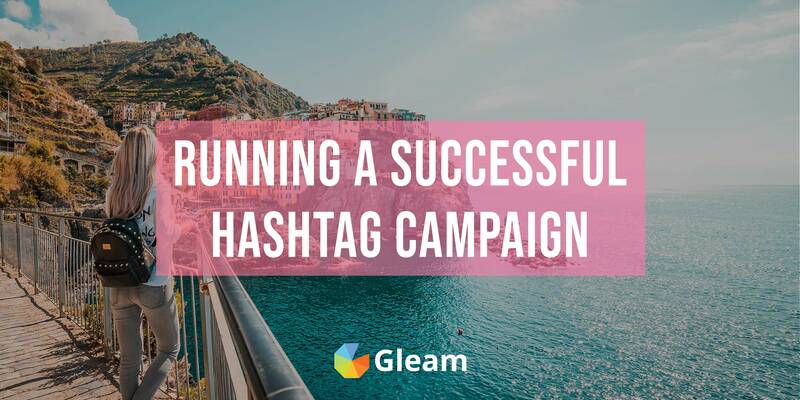 This is a tactic we regularly implement with our Product category of posts which focus on overcoming real challenges with the help of Gleam. This will help you put together a more authentic and timely pitch that will generate more leads. Whenever you publish a new blog post you should try to give it an eye-catching, attention grabbing title. When people are searching for something on Google or scrolling through their social media feeds you want your post to be the one that stops them in their tracks and drives clicks. Stay away from overly manufactured SEO titles. They will no longer help you appear favourably in the eyes of the Google algorithm, so you're far better off focusing on a title that conveys what your content is, and why they should read it. Most online traffic comes from mobile devices, and mobile usage is only getting more and more prevalent. This is why it's vital that your blog, and all of your onsite content is optimised from viewing on mobile devices. Producing high-quality content is clearly vitally important. But just as important as what you write, is what you write about. If you're not putting out content which your target market is interested in, or better yet, actively searching for, then you're not putting yourself in the best position to drive leads from your content. 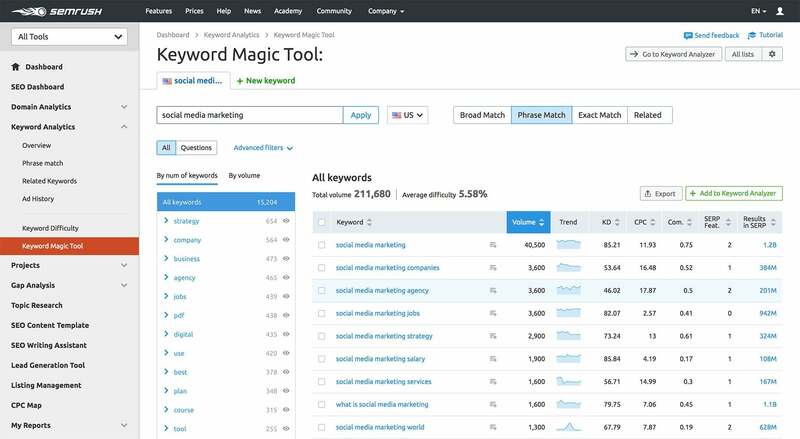 Try using tools like SEMrush and Ahrefs to examine the search traffic and keyword difficulty of various keywords relevant to your business and your audience. This can help you form a clear picture of what types of content your target market is looking for, and what types of content you should be producing. You can also use Ahrefs to check out what keywords your competitors are tracking for, but you're not. This is a great way to see where you're missing out on potential leads and what content you can produce to remedy the issue. Include the keywords you're targeting in the title of your post, as well as in headers and throughout the body. Just make sure you're only doing this at natural opportunities, you don't want to get punished for keyword stuffing. Create good URLs that are relevant, include your keywords, and aren't too long. Make sure your blog (and the rest of your website) is optimised for mobile devices and loads quickly. Use your meta-descriptions wisely. These should include your keywords, but also give a clear and concise summary of what your post is, and why users should read it. If you're able to rank well on Google you will be able to drive lots of relevant traffic to your site and start using your content to generate leads, so it's important you're doing what you can to optimise your content for search engines. While you're doing what you can to get your content to naturally rank on Google you sometimes might want to give it a bit of a boost. This is something you can do with Google Ads. 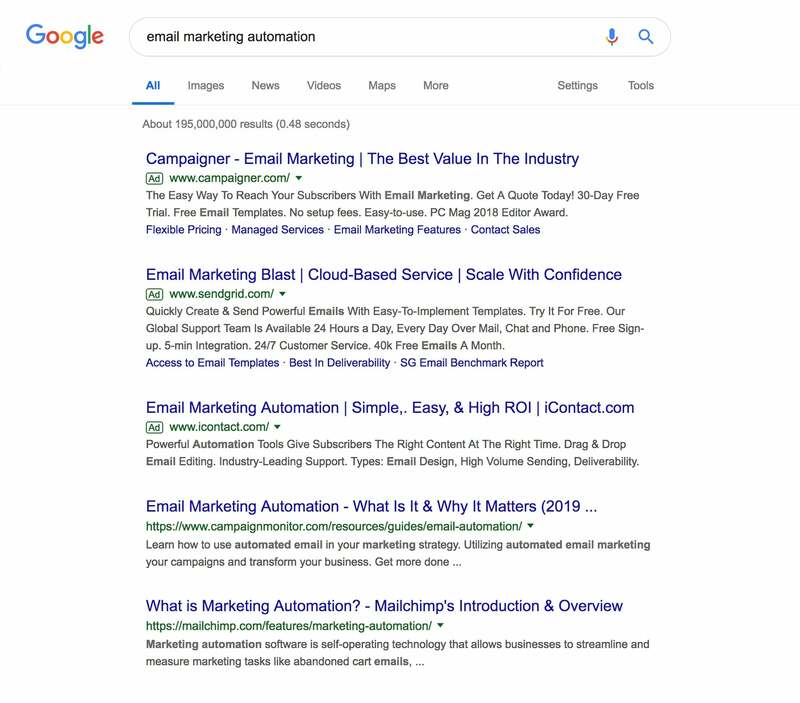 Using Google Ads to drive extra traffic to your landing pages is a highly effective way to put your product in front of users searching for the very thing you're offering. The key to an effective Google Ads campaign is targetting the right keywords. You need to target the keywords that users will search when they're seeking a service you can offer, or faced with a problem you can solve. When you think you've found some good keywords to target make sure you do your due diligence and use SEMrush, Ahrefs or another SEO tool to check out their search traffic. You also need to consider how many keywords you want to go after. If you use too many it becomes less likely that your ad is going to be as relevant to the searcher, making your ad less efficient, and less likely to generate leads. Try to stay within the 5-20 keyword sweet spot. Putting together high-quality blog posts will help you drive relevant users to your website through search engine results, but this is far from the only way you should be finding readers. Share your blog posts across of your social media channels, and encourage readers who liked your post to like share or comment on it. This will help you reach an even wider audience and maximise your chances of driving leads. 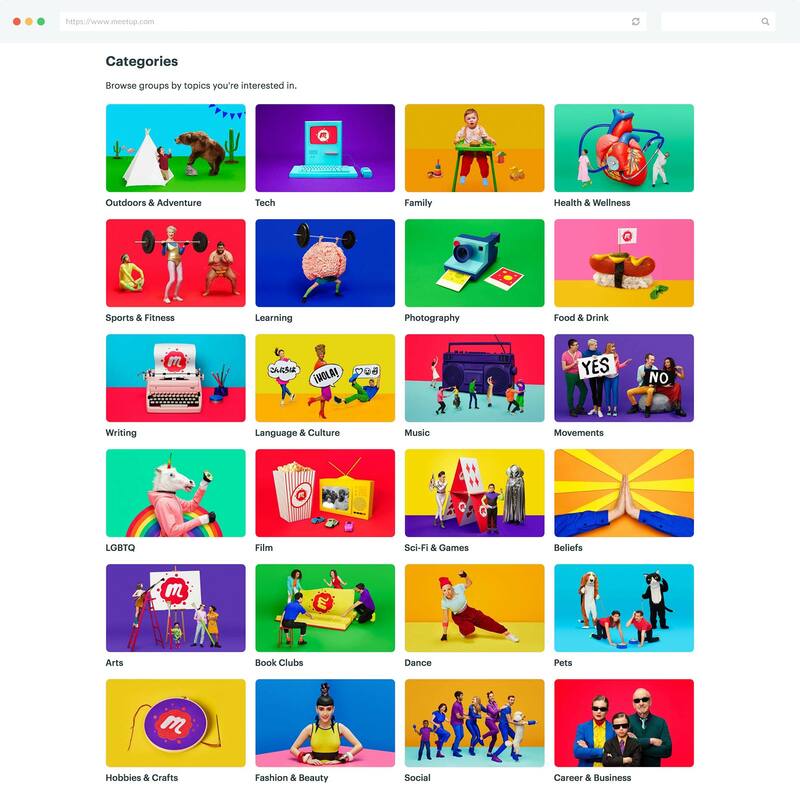 When you set out to create a powerful content strategy it's always a good idea to diversify the types of content you're producing. This will allow you to cover more topics, appeal to a wider audience and figure out what works best for you. One of the most valuable types of content you can start producing are case studies about customer success stories. This a particularly good move for SaaS businesses or agencies. This is a tactic we've had great success with. It's easy to say your product is great, it's a lot harder to show it's greatness in action. This is what makes case studies so powerful. By showcasing your success stories you will be able promote your offering in a highly authentic and engaging way which will build trust and help you generate leads. Case studies are fantastic for displaying on your website to help convert visitors, sharing on social to drive traffic, and of course getting you discovered on Google. The key to writing case studies that rank well on Google is focusing them on a problem you solve or a value you offer that coincides with the keywords your target market is searching for. This will help you attract relevant attention and generate promising leads. Another valuable type of content you can produce to help generate leads are in-depth product guides. These pieces should aim to give readers a detailed look at how they can use your product to solve their specific needs. Try putting together unique guides on all the ways people can use your product, and guides that are tailored to the ways specific consumer segments can use your products. This is an approach we have taken here at Gleam. We've put together a comprehensive library of guides that show users how they can best use all of our products. We've even put together a selection of unique industry-specific guides that showcase how users in different industries ranging from E-commerce to music can use our products. When you're making product guides you should try to include live demos where possible. Giving users a feel for your product goes a long way when it comes to generating leads and encouraging adoption. Putting together product guides is incredibly vital to generating leads. People might have a strong interest in your offering, but if they don't know how to use it they're far more likely to walk away without signing up. Plus, if your product solves a problem that your market commonly faces then you're guides will be able to grab the attention of people searching for a solution. If you're able to produce high-quality content that provides your readers with real, meaningful value then it's quite likely they'll be keen to get their hands on more of it. You can facilitate this by encouraging them to read more posts, or you can put together some exclusive high-value content and encourage readers to sign up in order to access it. If you've put together a brilliant guide on a topic and you offer your readers more advice on the same or a similar topic just for signing up they will be very likely to do so. You can easily do this by using Capture to create opt-in forms which redirect sign-ups to your bonus content, or add them to a list where you can send them the content via email. 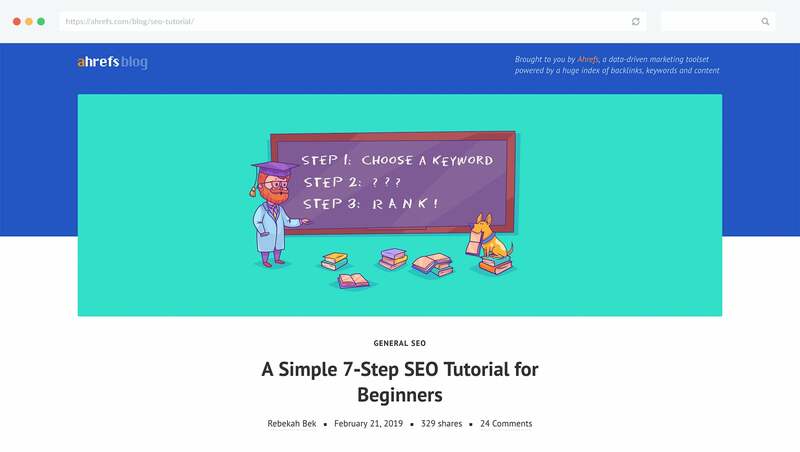 Learn everything you need to know about creating your own content upgrades and using them to convert readers in leads. Social media followers can, to some extent, be considered leads. Having said that, a social media follower is nowhere near as valuable as an email lead. They're harder to reach, communication is a lot less direct, and it's a lot easier to convert leads via high-quality emails than it is with a Facebook post. Social media is still a highly valuable tool though, and you should be making efforts across all of your social platforms to not only bolster your online following, but also drive further action from your audience and generate leads. Post engaging social media content. It's an obvious one, but it's still the single most important thing you can do to generate leads on social media. If you want to have any chance of driving traffic from social media to your website and converting them into leads then you need to be consistently engaging your audience and developing meaningful relationships with them. To do this you need to understand your audience and what they want to get out of their time on social media. Focus on providing them with real value instead of barraging them with ads. This will allow you to build positive relationships with your audience and when it does come time to promote your offering and drive traffic to your website you'll be a lot more likely to succeed. 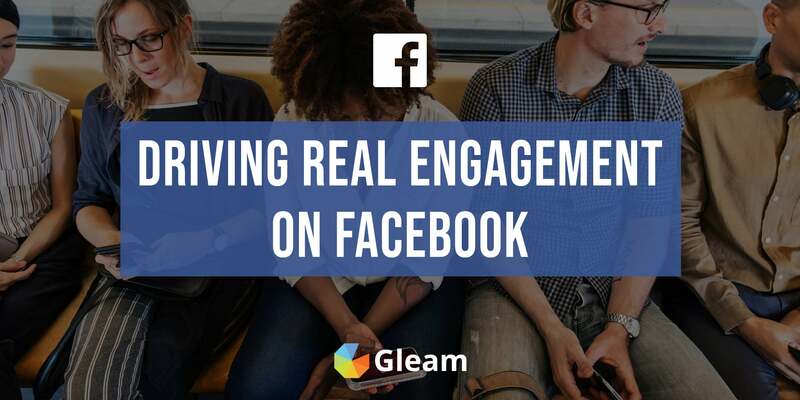 For more advice on how you can post engaging content and get the most out of social media check out our posts on driving engagement on Facebook, Instagram and Twitter. We mentioned the need to use social media to drive traffic back to your website, but how exactly can you do this? The first way is to simply share links to your website as part of promotional posts. There's nothing wrong with using social media to directly promote your offering as long as it isn't all you do, and you do it in an engaging and valuable way. Try enticing users to visit your website by encouraging them to learn more about your products, shop for new products, or even receive a special discount. And remember, if you're operating on Instagram (which is a hugely valuable platform for the fashion, beauty and travel industry) then you can directly link back to your site from posts. You'll have to promote a link in your bio, or drive traffic to your site from inside your Instagram Stories. Another effective approach you can take is to direct your social media audience to onsite content such as a blog post. If you can create content that your audience is interested in you should have no issues driving traffic, and we've already gone over how you can effectively generate leads from inside your blog. 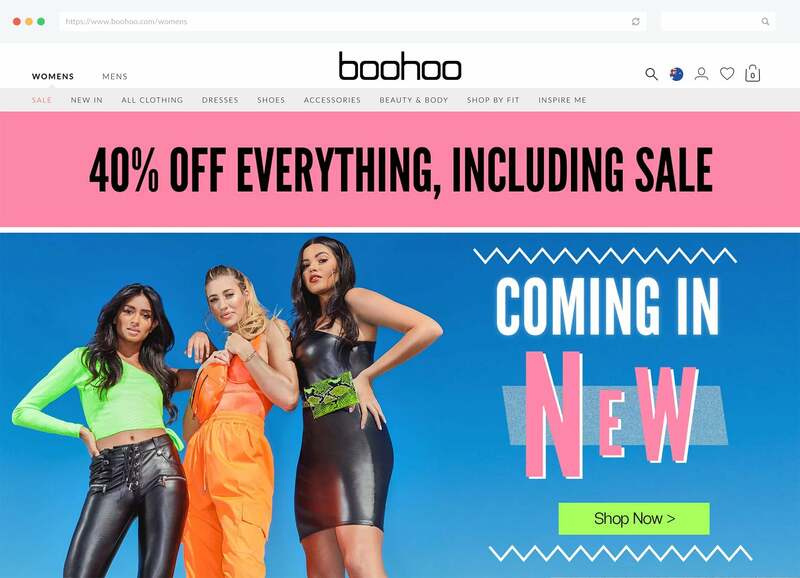 If you're an E-commerce retailer then there probably isn't a better way to encourage your social media audience to visit your website than offering them a discount. You can do this by simply running a sale and promoting it through your social channels, or you can make the offer even more enticing by setting up some exclusive welcome offers. 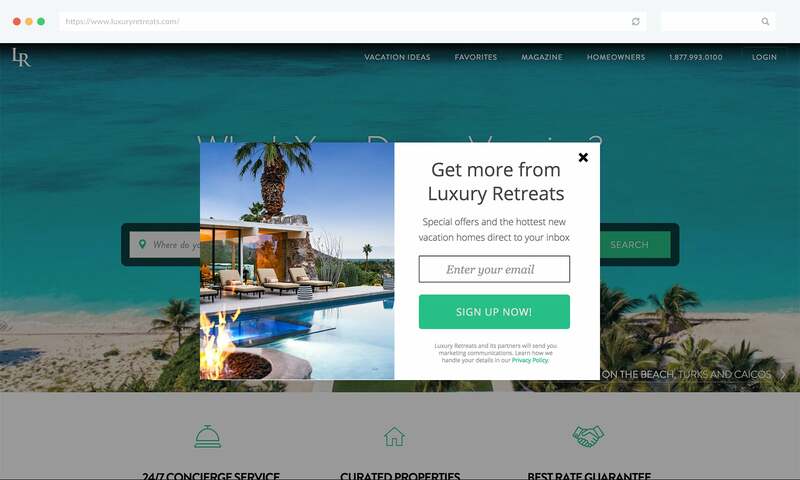 Welcome offers are essentially discounts you give to website visitors who arrive from a specified place and sign up with their email. These offers are incredibly easy to set up with Gleam Capture. Welcome offers allow you to share exclusive offers only available to users who were referred by your social channels. This is awesome, as posting on social media about exclusive discounts is an incredibly effective way to drive click-through from social media, generate leads, and even encourage some immediate sales. Find out how you can make your very own welcome offer and start generating leads from Instagram and other social media platforms. If you have a particularly high value post that you want seen by more social media users then it can be worth using Facebook, Instagram or Twitter ads to boost its visibility and put it in front of more users. This can be a good idea if you have some high-value posts which will be able to drive traffic to your website and encourage sign-ups. This can include videos explaining your offering and linking to your website, or posts promoting exclusive deals or welcome offers. 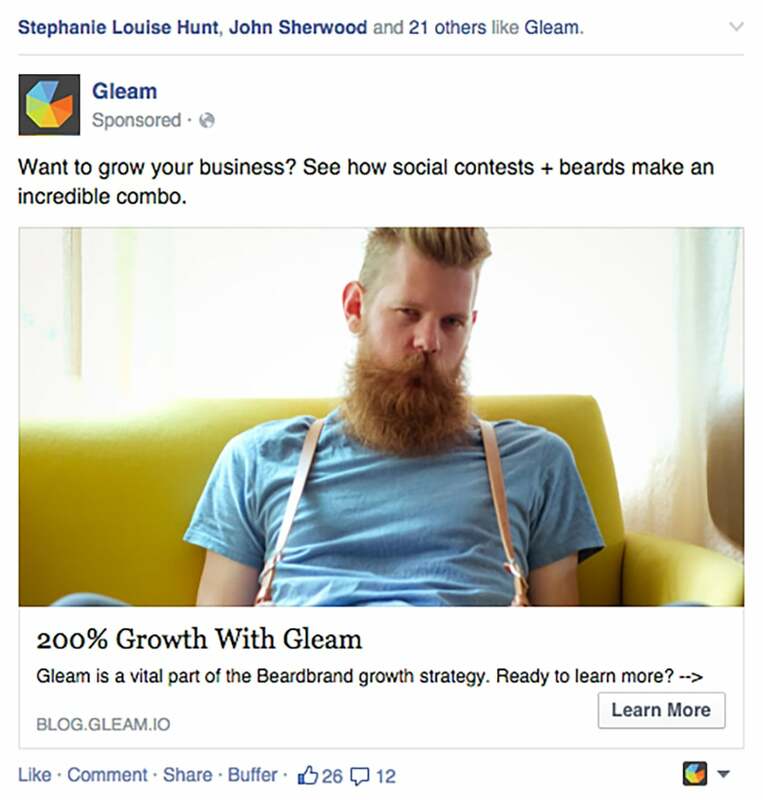 The key to a good Facebook ad is targeting the right audience, and tailoring your message towards them. Facebook's Audience Insights tool can help out with this. Your ads themselves should be visually appealing and use eye-catching, engaging imagery. You also need your ads to get to the point quickly, people don't have the longest attention spans when scrolling through their Facebook feed. You should promptly state your value, give users a reason to click-through and have a clear call to action in place. 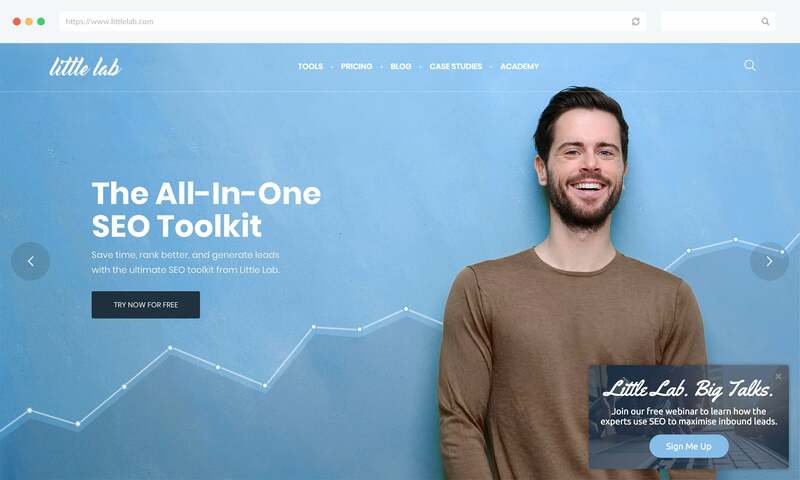 We've taken a good look at how you can optimise your website, content, and online presence to maximise lead generation, and now we're going to take a look at one of the most powerful tactics you can implement to skyrocket your lead generation. We're talking, of course, about running online giveaways. People like winning things, and they're willing to take action to do so. This simple fact is what makes giveaways such an effective lead generation tool. 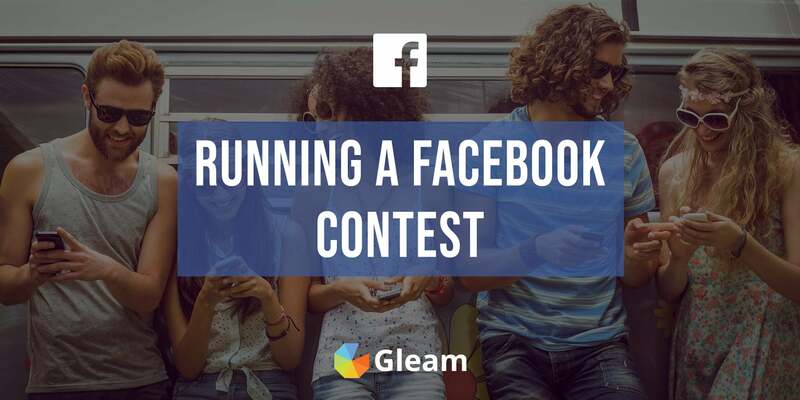 With Gleam's Competitions app you can run giveaways which allow users to enter the draw to win an awesome prize by signing up to your list, or completing a host of other powerful actions. You can create awesome giveaways which simply task users with signing up to your mailing list. You can even require them to sign in to enter with a mandatory subscribe action, and then present them with other valuable actions that they can complete to earn extra entries and increase their chances of winning. 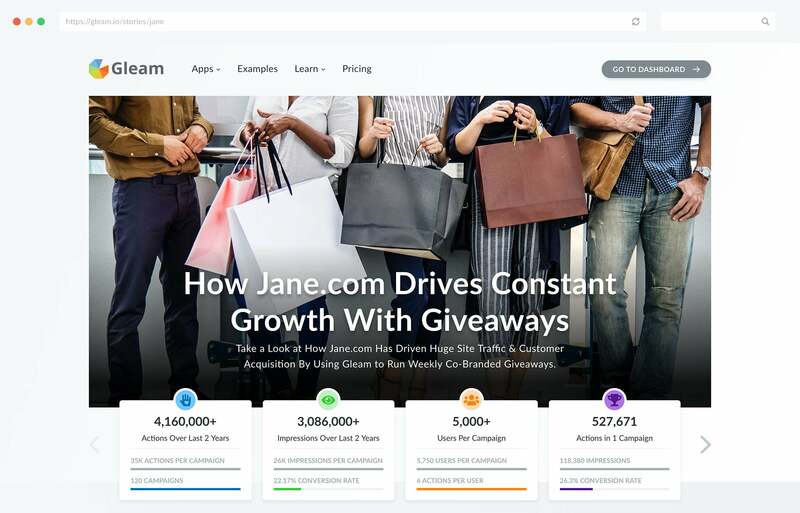 As well as generating leads via email sign-ups, you can also use your giveaway to drive other powerful actions including visiting or following your social media channels, checking out high value web pages, watching product videos, sharing the campaign with friends, and much more. 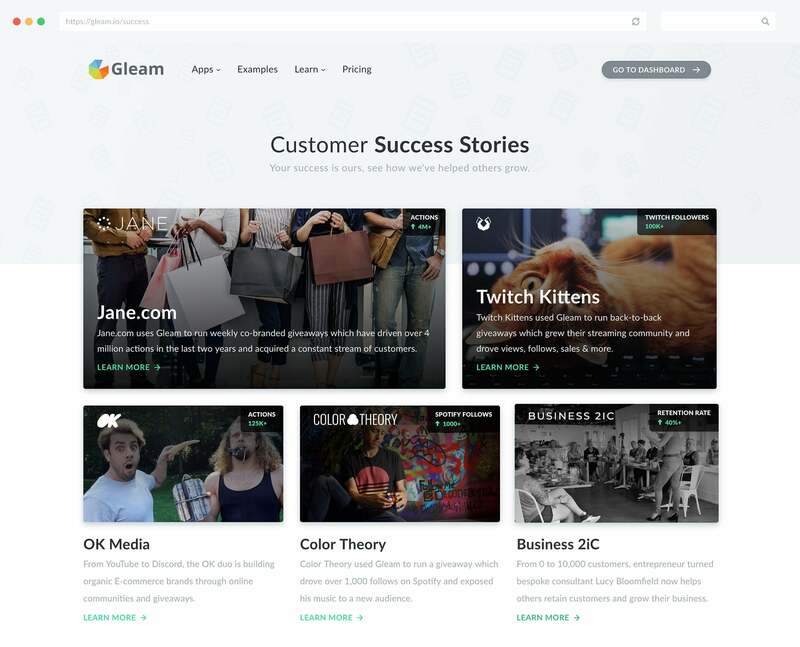 Take a look at the full list of entry methods available with Gleam and learn about all the powerful actions you can drive. When you run a giveaway for lead generation purposes, the most powerful actions you can incentivise (apart from sign ups) are viral shares. Our awesome viral share action allows you to award entries to users who share your giveaway with a friend who then enters the giveaway themselves. 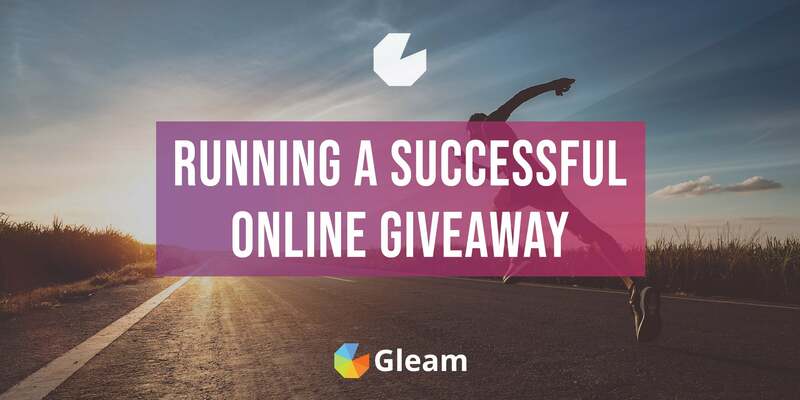 Running this type of giveaway can be unbelievably effective as you will be able to generate leads and kick-start a powerful cycle of social referrals that spreads your campaign to masses of relevant users and drives sign-ups from people you would have otherwise been unable to reach. This is probably the best thing you can do to extend your reach and generate huge amounts of leads with one simple campaign. Ready To Start Generating Leads? 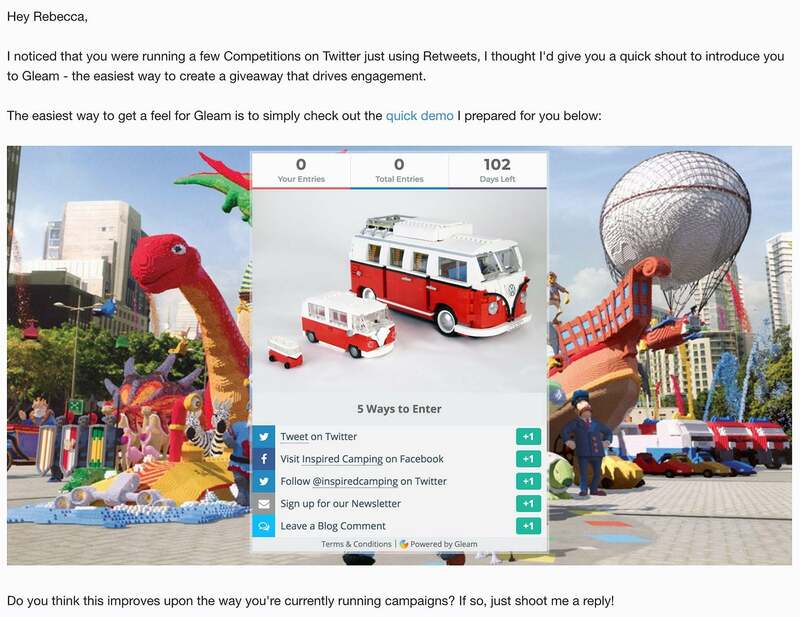 Check out our documentation on setting up your own giveaway or start generating leads now! Anytime you run a giveaway you need to make sure that you're offering up a prize that people want, and will be happy to sign up to your list in order to get their hands on it. You also need to make sure that you're giving away something relevant to your target audience. This will maximise the odds of generating leads with a real interest in your offering, and the potential to convert into product users and paying customers. Giving away your own product is often the best way to ensure that entrants have a real interest in you, but offering other prizes that are highly relevant to your niche should also do the trick. 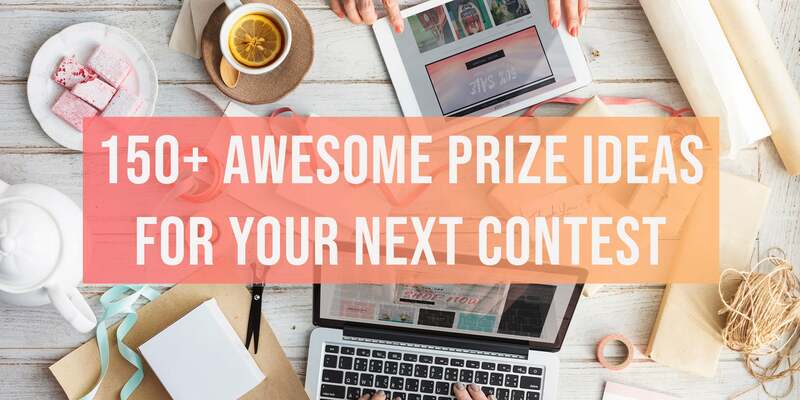 Learn more about what makes a great prize and check out over 150 of our favourite prize ideas for every type of giveaway and occasion. If you want people to enter your giveaway you need to make sure they see it first. Actively promoting a giveaway is always vital to its success, even if this is just to get the ball rolling before social referrals start carrying the load for you. One of the best ways to promote a giveaway is to share it on social media. You should post about on all of your social channels, and even encourage your following to share it around with their friends. If you're running a giveaway to generate leads then it might sound counterintuitive to promote it to users who are already subscribers, but it is still important. Sharing a giveaway with your existing leads and customers is a fantastic way to engage them and help strengthen your subscriber relationships. Plus, just because they're already on your email list it doesn't mean they can't still complete other valuable actions such as social referrals. Website visitors are highly relevant users who make for great leads, and presenting them with a giveaway inside your site is an awesome way to get them to sign up. 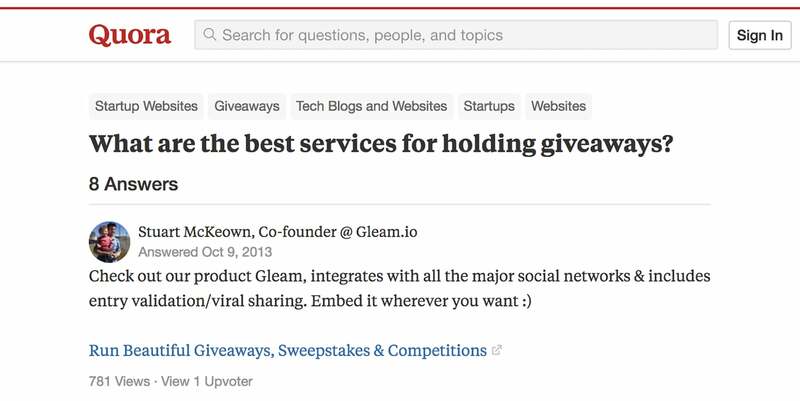 You can try announcing your giveaway with a notification on your website, create a dedicated "Giveaway" or "Win" tab, or with Gleam you can run your giveaway inside a popup and present it to your visitors at the opportune moment. If you're still in your early days as a business and are looking to find those vital first customers you may want to consider directly reaching out to prospective leads, telling them about your offering, what problems it will help them overcome and give them a clear call to action. This could be signing up for a free trial, entering an email sequence, or checking out your website. You can even try offering discounts and free accounts to early adopters to get the ball rolling. This is an approach that's best suited for SaaS and B2B businesses, and if done well can be hugely beneficial to new businesses looking to find customers. When it comes to reaching out to prospects to generate leads, there's nothing more important than reaching out to the right people. The key is to find the people that would benefit the most from your offering, so look for businesses in industries your product caters for, businesses facing the challenges you can help them overcome, and even businesses who are using or have used your competitor's product. If you try reaching out to your competitor's customers make sure you can come out on top of the direct comparison, whether it's by virtue of having an overall better product, better features, or a lower price. Once you've found some some solid prospects you need to find the right person to reach out to within the business. Depending on the size and nature of the company this might be the founder, the sales team, or whoever else is the most relevant outreach target for your offering. 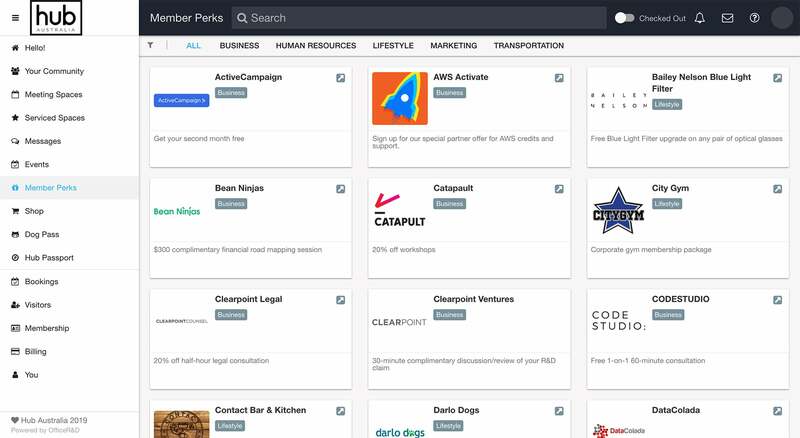 You can use tools like Hunter.io to find the right email address for all the companies you're targeting. Once you've found some lead targets to reach out to it's time to make contact. One of the best ways you can do this is by sending cold emails to as many prospects as you can find. Nothing will make email recipients tune out faster than a generic sales pitch. If you want to succeed you need to send out personal emails. Introduce yourself, use a personal name and email address, acknowledge the person you're emailing and their business, and give them some praise. You don't to use the precious time you've got with a prospect to talk about yourself. People are a lot more likely to be engaged by your email if you keep the focus on them, not you. Instead, spend your time showing them exactly what you can do for them. Show them what value you offer and how you can help them overcome the specific challenges that they're facing. You can even try mocking up a demonstration of how they could use your product. This is a tactic we've had success with. As well as sending out cold emails, you can also try reaching out to prospects on social media. This can provide you with the opportunity to reach out to prospects in an easy and friendly way. Plus, when you reach out with a public post you'll have the opportunity to welcome others into the conversation and attract more attention to your business. For an approach similar to cold emails you can send prospects a personal message on LinkedIn, or if you want to take a more public approach you can hit up some prospects on Twitter. Just try to keep it light and friendly. Twitter isn't the place to launch into a full blown pitch. It's also worth keeping an eye out for anyone talking about topics related to your business on social media. For example, if someone on Twitter mentions a challenge that you can help them overcome then being in a position to respond is invaluable. A lot of this comes down to being in the right place at the right time, but there are a few measures you can take to increase your odds of catching something worthwhile. You can try following relevant users in your niche, any businesses who could make for prospective customers, and people who follow your competitors. 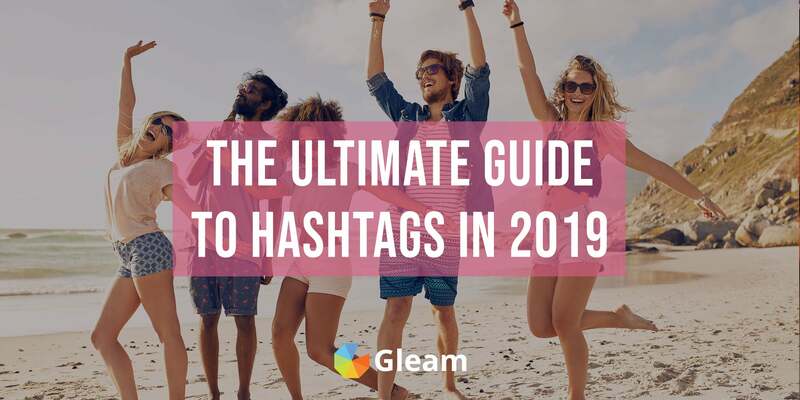 If there are any hashtags that are highly relevant to your business it's worth keeping an eye on them and looking out for any opportunities to reach out and make contact with potential leads. You can even for relevant terms such "alternatives to (your competitor)" to and see what pops up. Lead generation doesn't have to exclusively live online. Attending networking events and visiting coworking spaces can help you forge strong connections within your niche and generate some high-quality leads. A lot of coworking spaces even have member perk noticeboards where you can share a free or discounted offering with members of the coworking space. This can help you get your foot in the door and start driving leads. You can even checkout Meetup.com and look for groups that are highly relevant to your business. This can be a surprisingly effective way to make contacts and generate leads. These cold outreach strategies will never be the bread and butter of your lead generation and customer acquisition strategies in the long run, but there's nothing wrong with doing things which don't scale in your early days. In fact, when you're getting started things which don't scale are quite often the best chance you have at success. Now that we gone through all the core strategies you should be using, we're going to share a few more nifty tricks and tricks that can help you generate even more leads. The key to generating leads is engaging your audience, and one of the best ways to engage an audience is with interactive content such as a surveys and quizzes. Quizzes are a great way to get users to engage with your brand in an easy and fun way, and if you execute them well they can be used to generate leads by asking users who complete your survey or quiz to sign up to see their results, access more content, or even unlock a special deal or enter a giveaway. 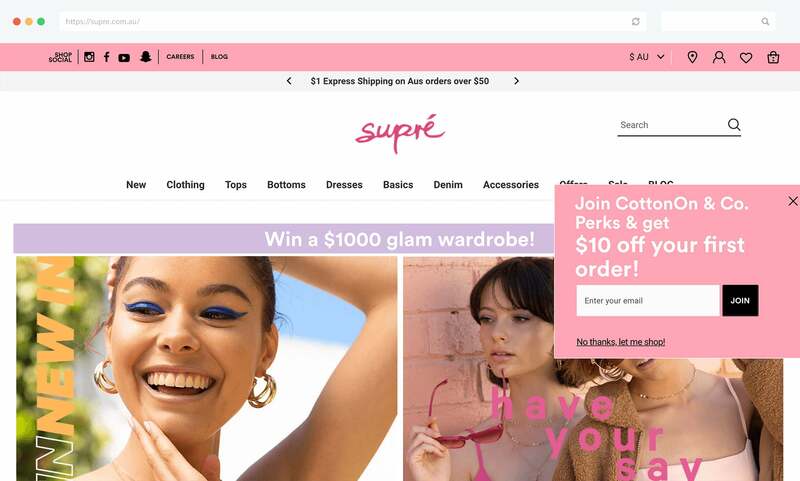 Lingerie retailer AdoreMe uses a quiz as users' entry point to their website. Visitors are prompted to complete a quick quiz to determine the perfect products for them, and they can then sign up to access tailored product recommendations and a special welcome offer. 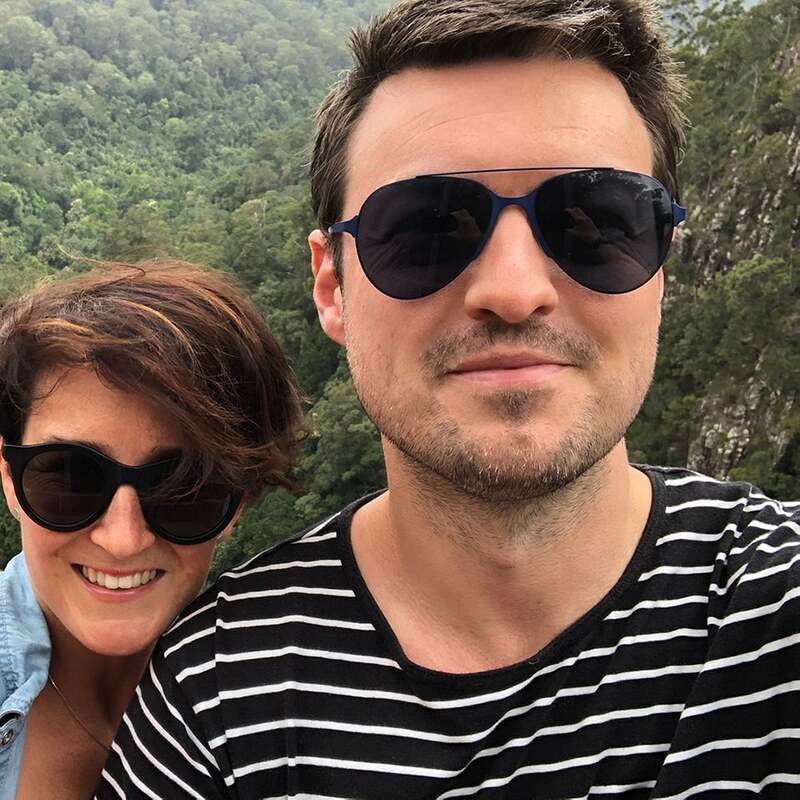 Contiki shares fun quizzes across social media as a way to drive traffic to their website, get users thinking about their offering, and encourage them to sign up for more engaging travel content. Make sure it's relevant to your business. Writing a guest post on a relevant blog can be a great way to gain some exposure, engage a relevant audience and encourage them to go check out your own blog. This can be a great way to tap into the larger audience of some well-established brands and publications and use it to bolster you own following. Try putting together some content that you think is a good fit for some blogs that you know accept guest posts, and reach out to the appropriate people with your offer. 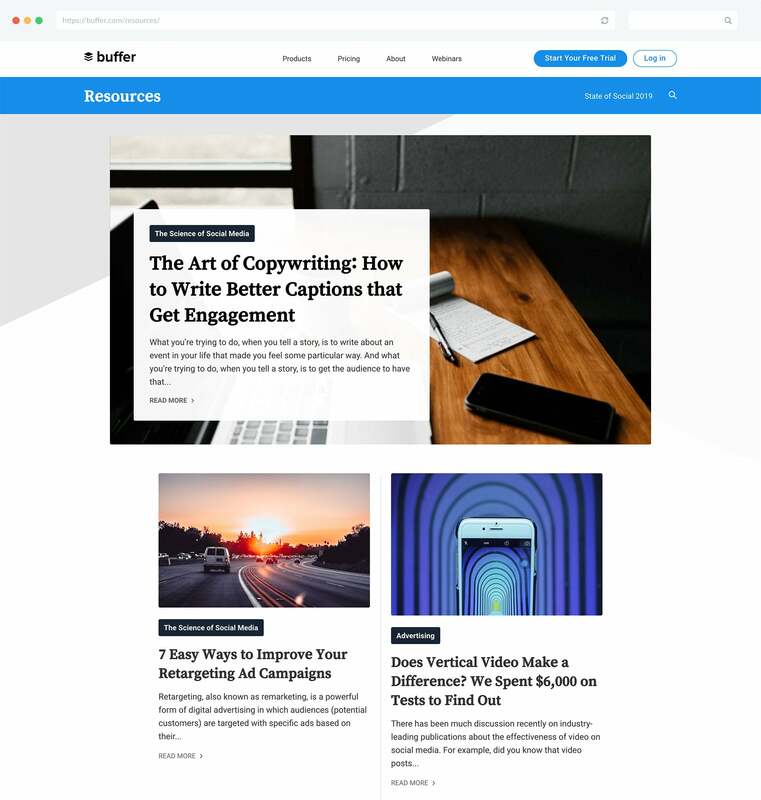 Just make sure you have some engaging content and lead generation strategies in place when you start encouraging readers to go check out more of your content. Another solid way to gain attention from a relevant audience is to search Quora for any questions that are relevant to your offering or area of expertise. If someone on Quora poses a challenge that you have the solution to then you should answer it in a genuine way that highlights the benefits of your offering and demonstrates how it can solve their issue. If you can answer people's questions in a helpful and informative manner that demonstrates that you understand their challenge and how they can overcome it you will be able to boost your credibility, encourage people to check out your business and ultimately drive leads. When you answer Quora questions you won't only be able to engage the question asker, but also all those who come across the question while searching for their own answers. 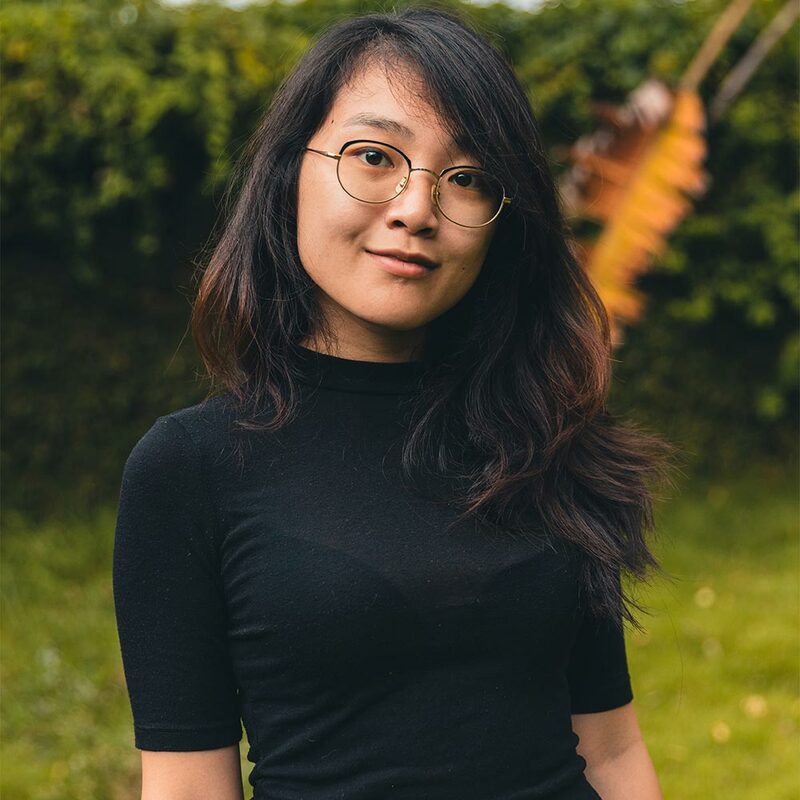 If you're creating and releasing a new tech product then launching on Product Hunt is one of the best things you can do to expose yourself to a helpful and relevant community that will help you generate leads, encourage trial, and even get some solid advice on how you can improve you offering. 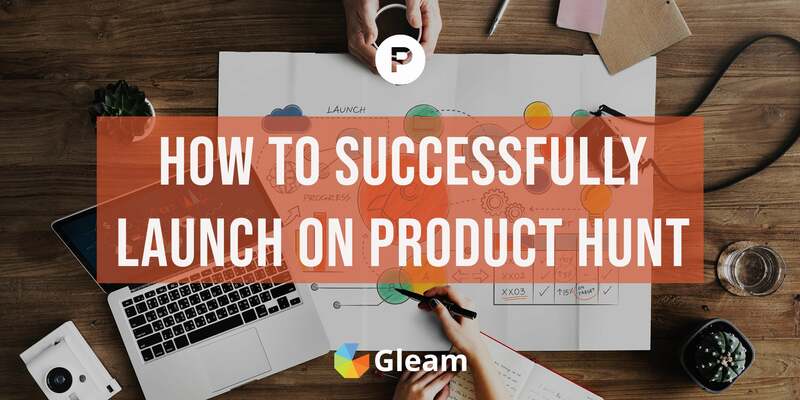 Find out how you can use a Product Hunt launch to boost exposure and start generating leads. If your product integrates with other platforms and products then it's a good move to celebrate the integration with some mutually beneficial cross-promotion. Get featured in newsletter and blog posts. Have the integration announced on social media. Gain exposure in your integration partner's app store. 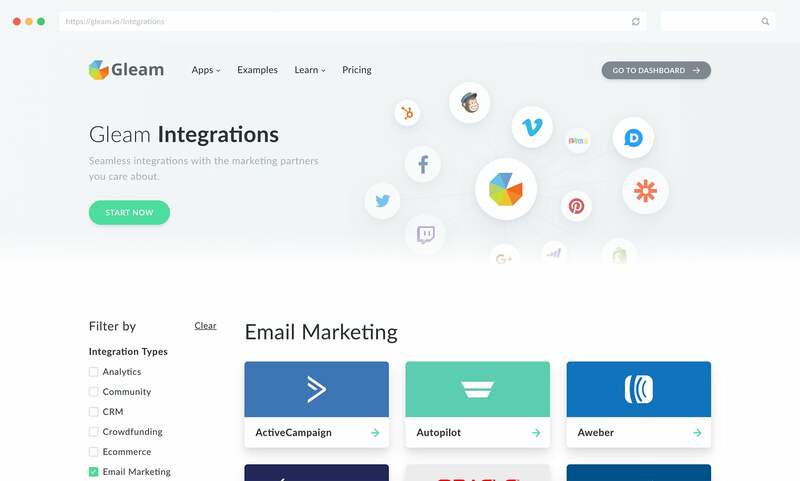 Here at Gleam we have integrations with over 60 platforms, and we've been able to leverage these integrations to boost our exposure and generate leads through cross-promotional efforts such as onsite recommendations and features in blog posts. If you've built an app that customers are using and putting in front of their own audience then you should build a Powered By link into your apps footer, or anywhere else it fits. This will build exposure and give everyone who is interested in your app an easy way to click-through and check it out in more detail. And remember, you don't have to stick to the classic Powered By phrasing. In face, we had great success when we split tested the phrase to find some better alternatives which you can read all about here. As a general rule, videos are great. They're engaging, eye-catching and easy to consume. Putting together an informative (and interesting) video about your product is a terrific way to concisely explain and demonstrate your offering in an engaging way that will help build favourable perceptions, build product interest and drive leads. 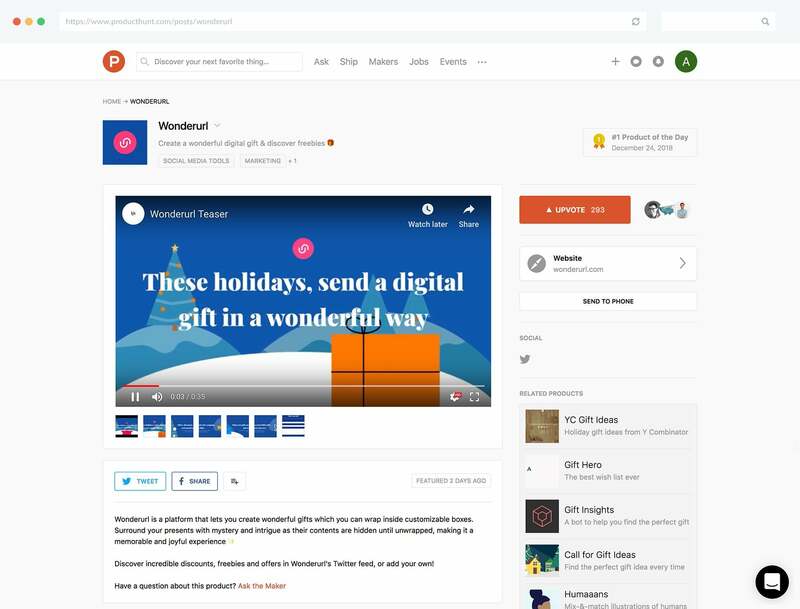 You can share product videos on your landing page and across social media, or you can even get users to watch them as part of a giveaway. However it is you want to share product videos, it's always a good move. 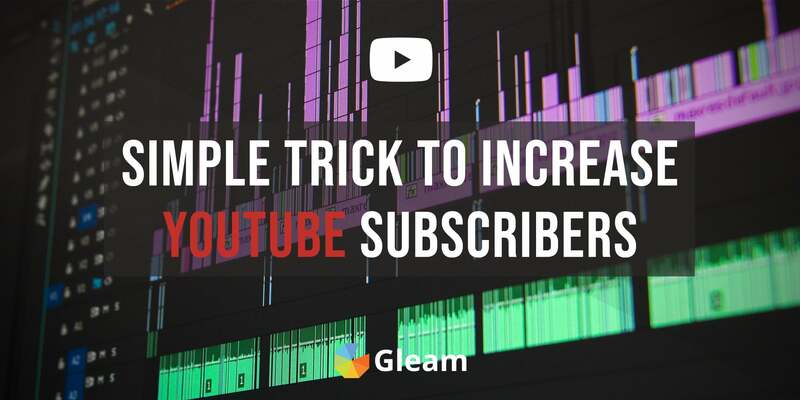 One particularly effective way you can use videos to aid lead generation is by creating helpful how-to videos on YouTube which provide viewers with real value whilst positioning your product as a solution and driving users through to your products. 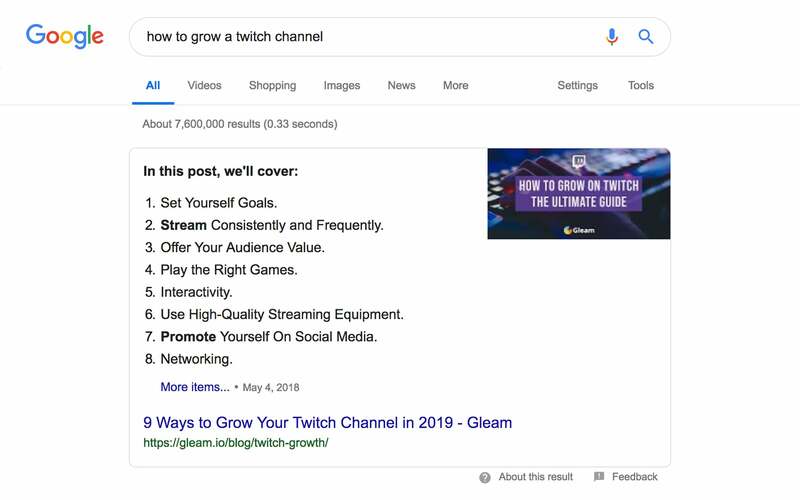 Producing how-to videos on common situations that people are actively searching for will help you find viewers, but it's always a good idea to promote your content across social media (and possibly on your own website) to maximise views. This is a strategy that Beardbrand have had great success with. They use their YouTube channel to share instructional videos that give viewers great advice on beard and hair maintenance and styling, as well as showcase their products in action and drive traffic to their store. With this arsenal of powerful tactics and strategies at your disposal you should be feeling to get out there and start generating the leads you need to help your business grow. Good luck and remember, leads are the key to your success, and you should never stop striving to generate them. Ready to Convert Leads Into Customers? Once you're using these lead generation tactics to generate leads you'll be ready to start driving sales from your email list. Find out how in this awesome guide. Want More Advice On Growing Your Business? Take a look at our in-depth list of awesome prize ideas and find the perfect prize for your next contest.